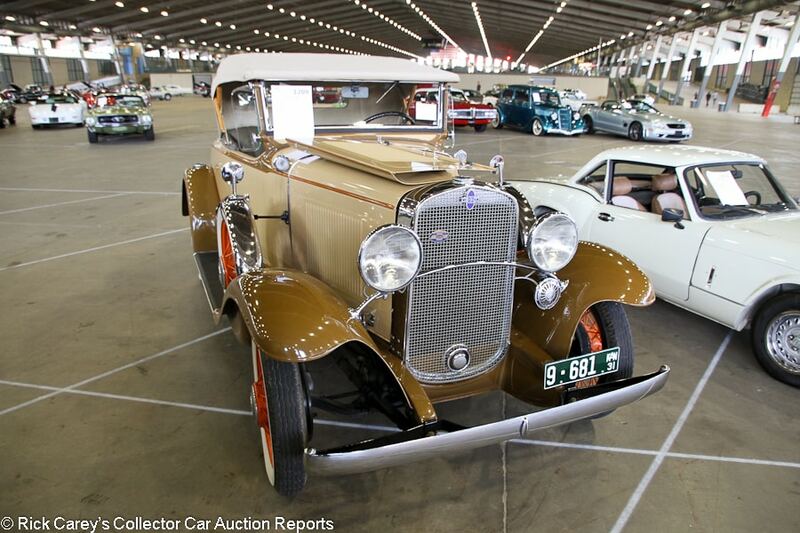 Few collector car auctions have the history of the Leake Auction Company. 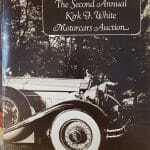 Begun in the Sixties by James C. Leake, Sr. out of his passion for old cars and particularly Rolls-Royces, it has been continued by his daughter Nancy and her husband Richard Sevenoaks. The third generation, their daughter Audrey and her husband Ty Young, are now actively involved, and there’s a fourth generation’s presence, too, but too small currently to do more than demonstrate pedal cars. Not surprisingly there’s a friendly, family attitude at the Leake auctions which now include two Dallas sales and one in Oklahoma City in addition to the Tulsa site at the River Spirit Expo that succeeds the original 1964 Leake auction site in Muskogee. Held in the shadow of the Big Driller, Leake’s Tulsa auction like its others demonstrates the resilience of the petroleum (and natural gas) based economy of Texas and Oklahoma. Cheap oil hasn’t lessened the region’s enthusiasm for the automobiles whose demand for fuel underpin the region’s economy. New competition has impinged upon the Leake franchise, but Nancy and Richard, Audrey and Ty have responded with innovations that keep drawing consignors and buyers. Without going into details, the Leake Auction Company has carried on Jim Leake, Sr.’s tradition of exploring new and thoughtful ways to make the connection between sellers and buyers. At Tulsa this year 45 lots sold on hammer bids under $5,000, another 64 lots filled in between there and $10,000. That’s plenty of affordable and, as several cars reported below will show, eminently usable cars for accessible prices. Most of them need attention, but that is what owning a collector car is about. In other words, Leake Tulsa is a place to find good, accessibly priced collector cars in a friendly, accommodating environment. Andrew Newton was on-site and contributed the observations and photos; don’t blame Andrew for the final content, though: It’s the responsibility of the editor. 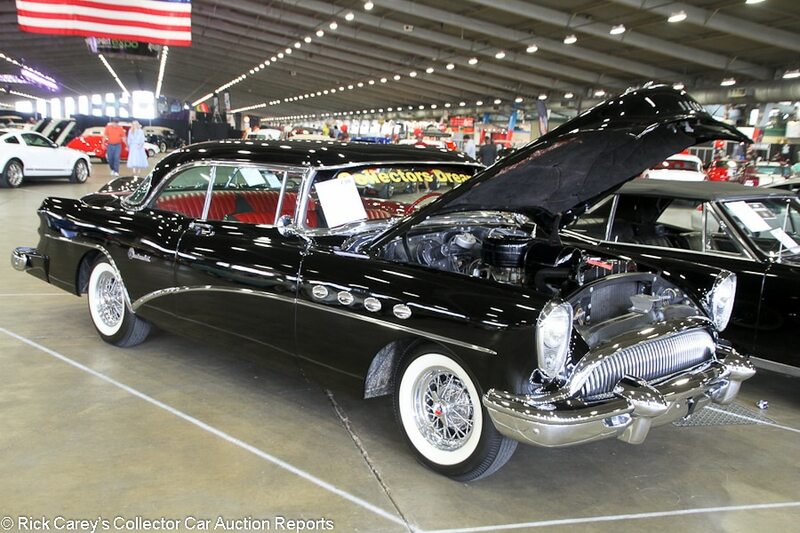 As in the last two auction reports Leake Tulsa is sorted by Marque, Model, Body Style and Year for easier searching. 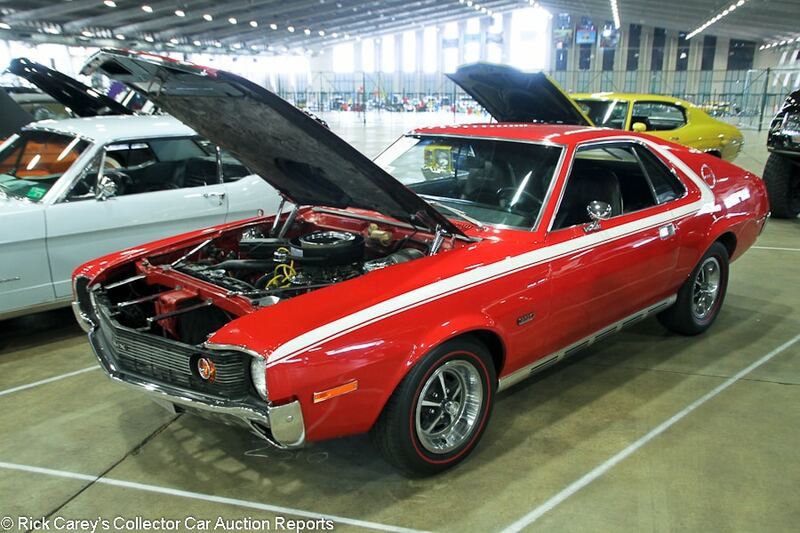 Lot # 2511 1970 American Motors AMX Fastback; S/N A0M397X119117; Red, White/Black vinyl with cloth inserts; Older restoration, 3 condition; Not sold at Hammer bid of $21,000. With Reserve. – 390/325hp, 4-speed, Twin Grip axle, Magnum 500 wheels, red line tires, rear window slats, Hurst shifter, Sonomatic cassette stereo with aftermarket speakers in the back, Go Package, power steering, power front disc brakes, tilt steering column. – Clean engine bay with recent detailing. Crazing in the paint on the hood. Cracked reverse light lens. Chips at the back of the driver’s door. Very good interior other than some waviness on the dash top. An older restoration that could use new paint, but is mostly good enough for what it is. – While this AMX does need paint, the reported high bid was bid to a third under what an AMX with this equipment deserves. 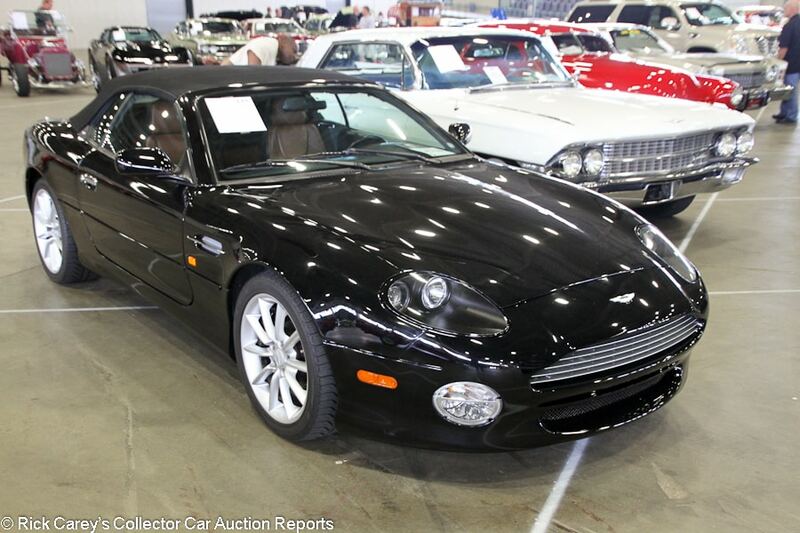 Lot # 175 2002 Aston Martin DB7 Vantage Convertible; S/N SCFAB42322K402883; Black/Brown leather; Black cloth top; Unrestored original, 2- condition; Hammered Sold at $34,750 plus commission of 10.00%; Final Price $38,225. With Reserve. – 5935/420hp V-12, automatic, alloy wheels, cross-drilled rotors, air conditioning, power windows, power seats, power top, Pioneer CD stereo, wood dash, brown leather boot cover. – A few scuffs on the wheels that could probably buff out. A few tiny chips on the mirrors. Mostly good original paint. Very lightly wrinkled seats. A used Aston with 29,990 miles but a well-kept one, although there is no service history represented. – Aston prices tend to depreciate like rocks until they become collectible, and the DB7 is currently the cheapest way to get into Aston Martin ownership. You get the stylish good looks, a premium badge and V-12 power often for roughly the price of a new Mustang GT, but the catch is of course the big service bills. This car went for a price that was slightly favorable to the buyer, but was still appropriate. 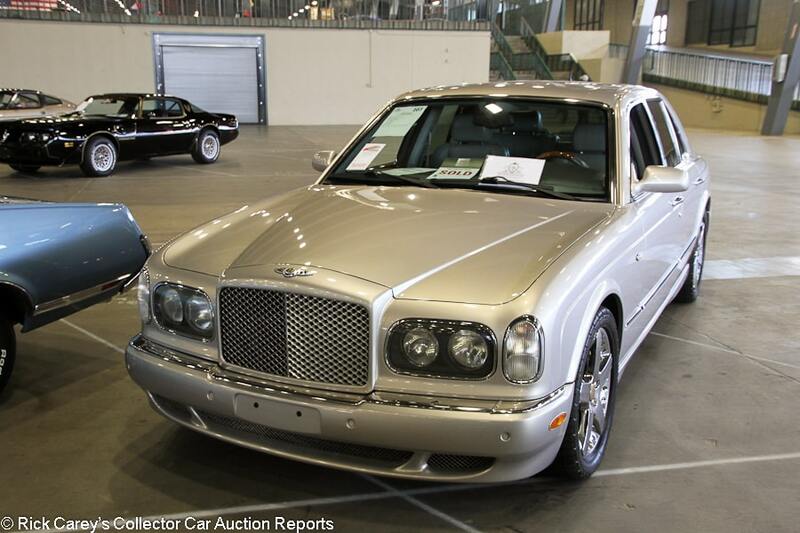 Lot # 207 2003 Bentley Arnage RL 4-Dr. Sedan; S/N SCBLC37F73CX09448; Silver/Gray leather; Unrestored original, 2- condition; Hammered Sold at $35,500 plus commission of 10.00%; Final Price $39,050. No Reserve. – Chromed wheels, tinted glass, power everything, opera mirrors, sunroof, tables in back, HUD monitor. – No service history represented. Three small touched up chips on the front edge of the hood and light scratches on the chrome rear bumper trim, but it otherwise looks very good on the outside. The interior looks fantastic as well aside from very light wrinkling on the front seats. Showing 46,386 miles which the seller claims are from new. Doesn’t look like a new car, but close. – Sold for $74,900 at Mecum Monterey in 2013, then sold for $41,250 at Leake Tulsa two years ago. This car cost over $200,000 when it was new and it will still makes you look like a millionaire. This was certainly on the cheap side for even a used one with some miles, but a head gasket on one of these cars is a five-figure job, which puts things into perspective. 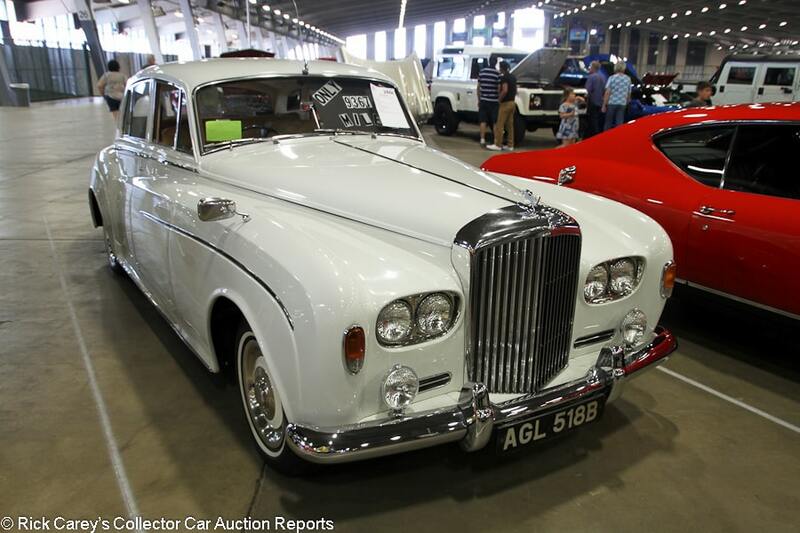 Lot # 2444 1964 Bentley S3 4-Dr. Sedan; S/N B32FG; White/Tan leather; Older restoration, 2- condition; Not sold at Hammer bid of $25,000. With Reserve. – Wheel covers, narrow whitewalls, dual wing mirrors, Flying B hood ornament, Lucas driving lights, Sony CD stereo with rear seat speakers, power windows, air conditioning in the front and rear. – Represented as unrestored, but it has gotten serious attention. Does not have original tools. Decent older repaint with a few blemishes. Cracked windshield gasket. Solid underneath. Tidy maintained engine bay. Can’t find any rust. Sound interior wood that may be original and good newer upholstery. It looks like it was set up as a wedding car given the stereo and air conditioning and claimed to be 9,368 original miles. No representation of service history, which is not a good sign. – The V-8, quad-headlight S3 is worth considerably more than early Bentley S-series cars. It’s hard to bid with confidence on any classic Bentley with an ambiguous history, and Tulsa probably wasn’t the right venue for it. The reported high bid was less than project car money and therefore way off from what any decent S3 deserves. 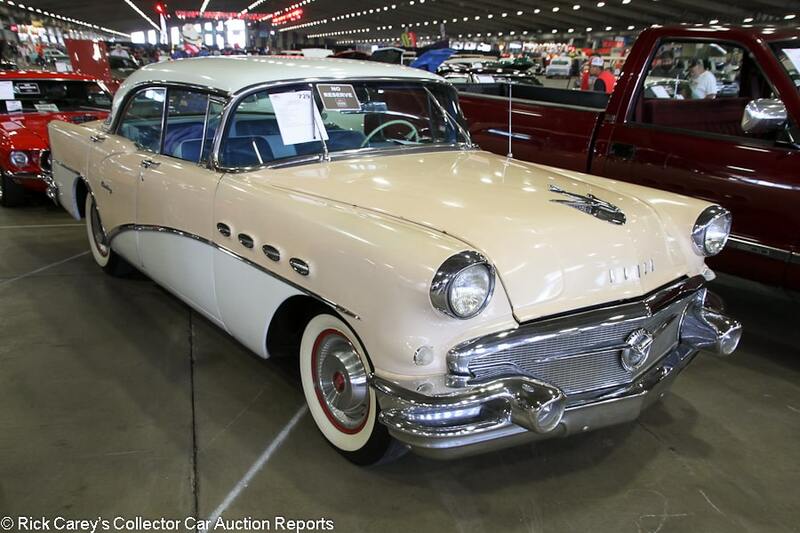 Lot # 729 1956 Buick Century 4-Dr. Hardtop Riviera; S/N 6C4012543; Beige, White/Light Blue vinyl with cloth inserts; Visually maintained, largely original, 3 condition; Hammered Sold at $9,000 plus commission of 10.00%; Final Price $9,900. No Reserve. – 322/255hp, Dynaflow, wheel covers, whitewalls, power steering, air conditioning, power windows, power seat, Sonomatic AM radio, dash clock. – From the HG Ground collection. Rough but presentable original paint with chips and scratches all over as well as rub through on the right front fender. Lots of cracking and crazing on the roof. Dull but decent chrome and brightwork. Very good newer upholstery. The rest of the interior is well kept and original. A mostly original car that looks tired but has a certain charm for people who are into patina. – This is arguably a better car than the money it brought but the 4-door hardtop body style has limited appeal and even the Roadmaster-engined Century becomes mundane with sedan coachwork. It would not have been expensive at even 25% more, but it is not unreasonably inexpensive at this result. 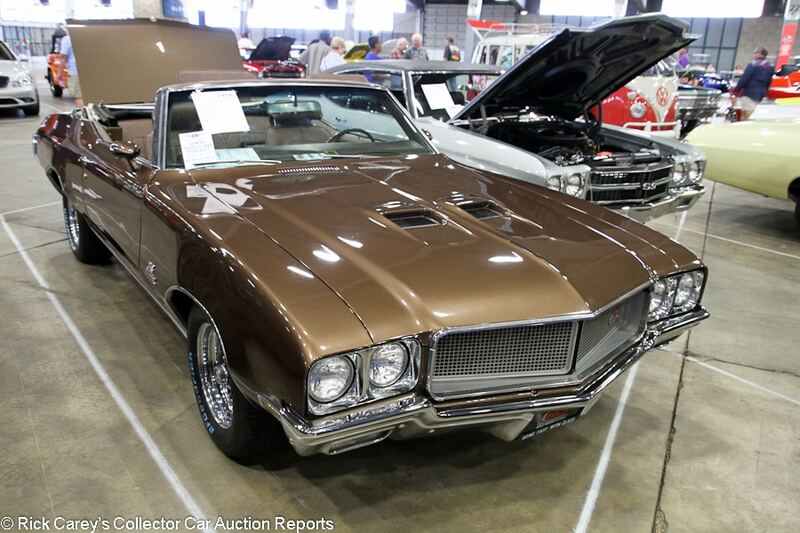 Lot # 2458 1970 Buick GS 455 Convertible; S/N 446670H184589; Brown/Brown vinyl; White vinyl top; Older restoration, 2- condition; Hammered Sold at $30,000 plus commission of 10.00%; Final Price $33,000. With Reserve. – 455/350hp, automatic, Radial T/A tires, power steering, power brakes, dash clock, horseshoe shifter, radio, Moon oil pressure, water temp and volt gauges, console, dash tach. – Good paint and chrome. Even gaps. Very good interior. Fender lips don’t quite fit straight. Light road wear but restored underneath. Clean, lightly run engine bay. It isn’t clear when this car was restored, but it looks like a high quality body-on job and still looks reasonably fresh. – The GS is sometimes overlooked in favor of its GM cousins like the 442, Chevelle and GTO even though it offered similar performance and style. This example flew under the radar as well, with the buyer getting an attractive restored car with no apparent needs for the kind of money that would ordinarily buy an average driver. 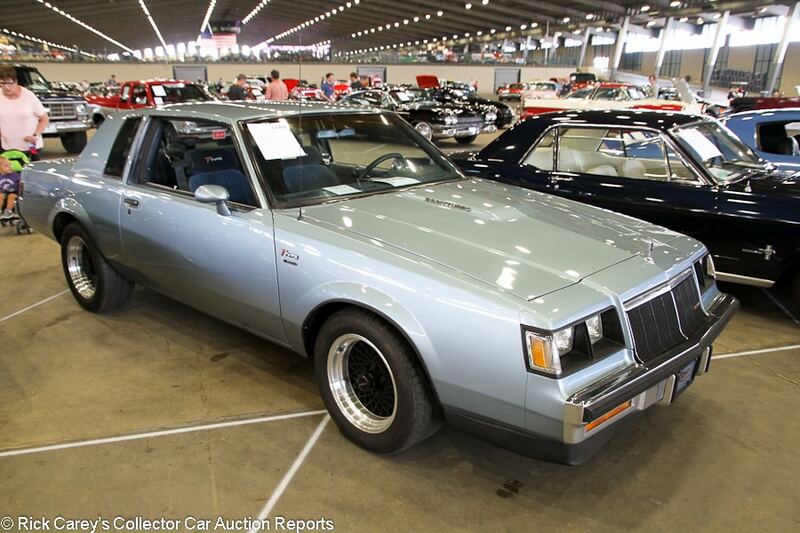 Lot # 1189 1986 Buick Regal T-Type 2-Dr. Hardtop; S/N 1G4GK4774GP219169; Silver Poly/Blue cloth; Visually maintained, largely original, 3+ condition; Hammered Sold at $8,800 plus commission of 10.00%; Final Price $9,680. With Reserve. – 231/235hp turbo V6, automatic, power steering, cruise control, GNX wheels, aftermarket cold air intake, 3-inch stainless exhaust, Pioneer CD stereo, power windows, climate control. – The hood ornament is loose. Lightly scratched front bumper. Good older repaint other than a crack behind the driver’s door. Small cracks in the taillight lenses. Mostly good interior other than some light wear to the seats. A mostly good driver quality example of a car you don’t often see anymore. A car for someone who wants a Grand National but doesn’t have a ton of money and doesn’t like black. 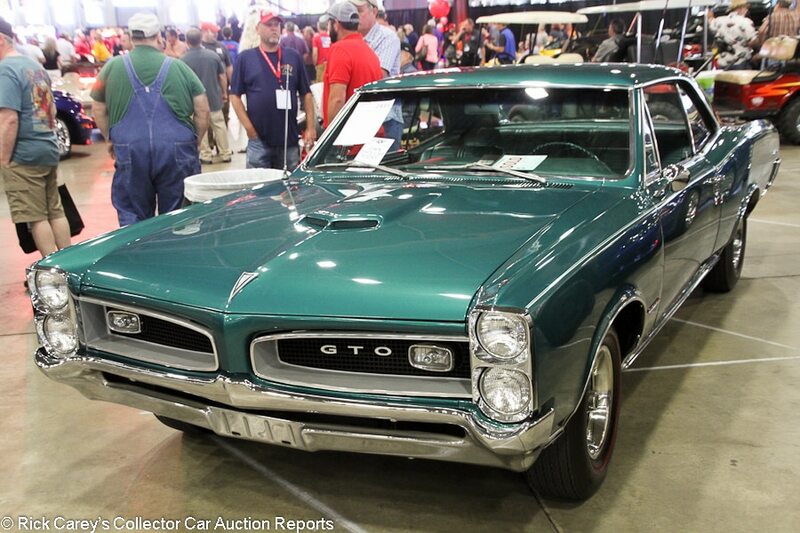 – Sold at Mecum Kissimmee last year for $9,900, then not sold at Dan Kruse Austin last year at a $9,000 high bid. Perhaps this car is a bit too obscure, or maybe people are put off by the otherwise sensible mods. For it not to break five figures seems unusual, but bidders have spoken three times in three different cities. 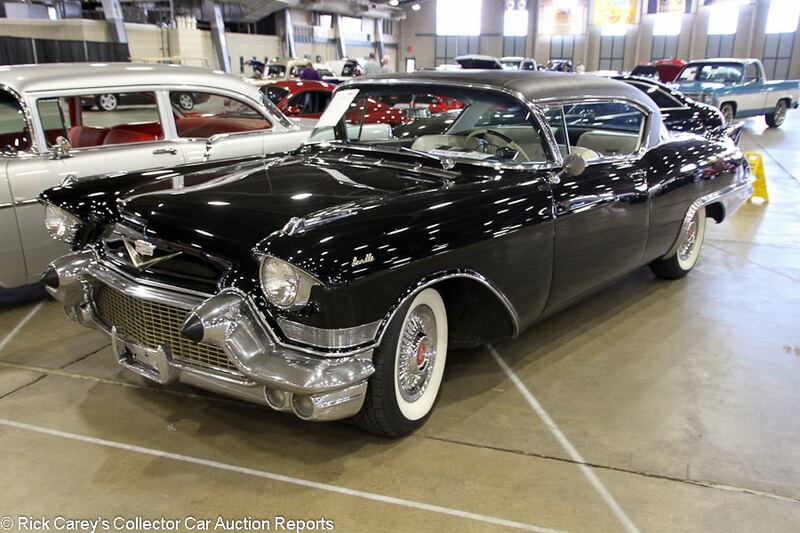 Lot # 1134 1959 Cadillac Coupe de Ville 2-Dr. Hardtop; S/N 59J091393; Black/White, Black; Visually maintained, largely original, 3+ condition; Hammered Sold at $31,500 plus commission of 10.00%; Final Price $34,650. With Reserve. – Wheel covers, whitewalls, power steering, power brakes, power windows, pushbutton radio, dash clock, heater, fender skirts. – Big scratch on the outside mirror. Scratched up bumpers and brightwork. Body side trim doesn’t fit flush. Good older paint. Represented with new tires and seat covers. Dash top is a little wavy but the interior is mostly very good. Rusty exhaust. Leaking oil. Never restored, but kept up with well enough to keep it presentable. – A big, impressive automobile that has been kept up just well enough to give the new owner some confidence it has few hidden needs and bought appropriately for those conditions. 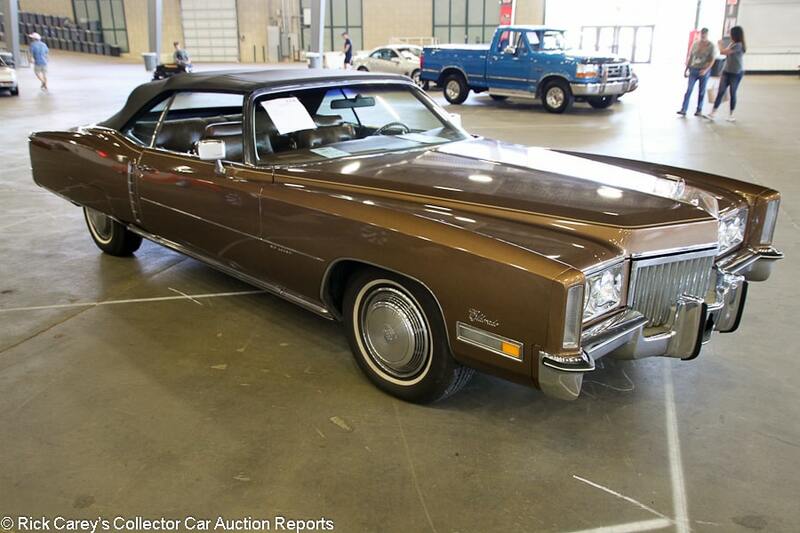 Lot # 114 1972 Cadillac Eldorado Convertible; S/N 6L67S2Q426135; Brown/Brown leather; Black vinyl top; Visually maintained, largely original, 3 condition; Hammered Sold at $7,600 plus commission of 10.00%; Final Price $8,360. With Reserve. – Wheel covers, narrow whitewalls, fender skirts, power windows, power top, air conditioning, woodgrain trim. – Tight, clean new top. Engine rebuilt 5,000 miles ago. Dull original chrome. Good, relatively shiny original paint, but there are a few blisters and some crazing on the tail. Doors stick slightly out at the bottom. Light road wear underneath. Very good, lightly worn original interior. These earthy 70’s colors don’t add much to an inherently stylish car and this one is in no better than average driver quality condition, but you’d be happy to be seen in it. – A great parade car or weekend driver even in these muddy colors and a sound value at this price which could have been a few thousand more without being excessive. 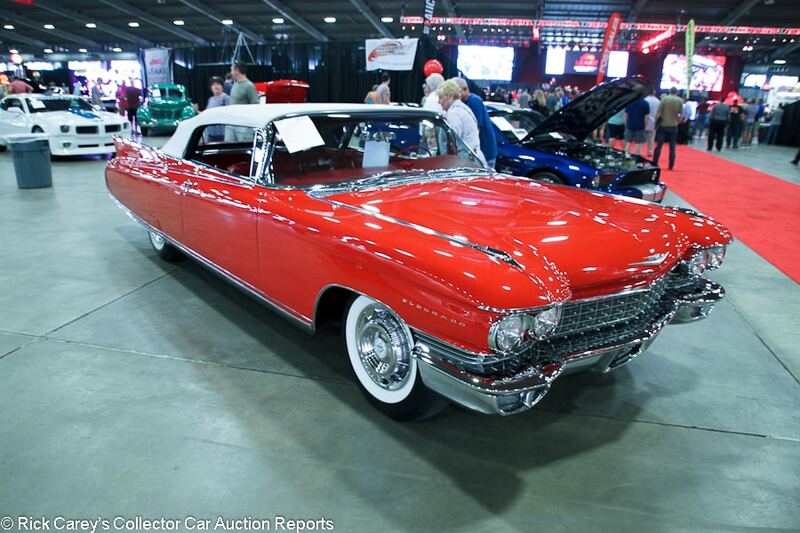 Lot # 475 1960 Cadillac Eldorado Biarritz Convertible; S/N 60E113526; Red/Red; White vinyl top; Older restoration, 2- condition; Hammered Sold at $117,500 plus commission of 10.00%; Final Price $129,250. With Reserve. – 390/345hp, three 2-barrel carbs, automatic, wheel covers, whitewalls, fender skirts, Autronic Eye, power windows, power steering, power brakes, power top, power seats, pushbutton radio, factory air conditioning, parade boot. – Excellent bumper chrome. Sound original brightwork. Good older paint. A few chips at the back of the door edges. Small but significant touched up dent on the left rear fender. Good top. Sound older interior. Light road wear underneath. Fully restored and will still get plenty of looks and thumbs up, but the work is showing its age. – This is a great parade or local show car with a quality restoration that will benefit from a little attention and effort. The Tulsa bidders recognized the value and paid a realistic retail price to own it. 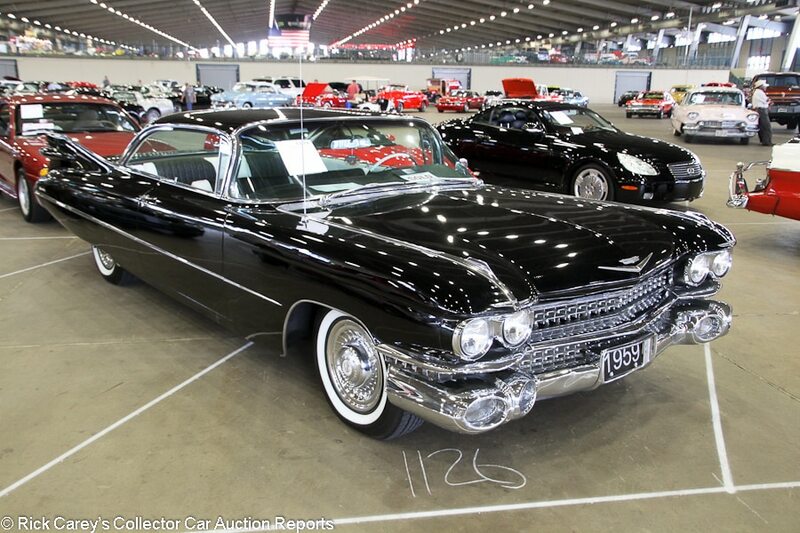 Lot # 457 1957 Cadillac Eldorado Seville 2-Dr. Hardtop; S/N 5762054552; Black, Black vinyl roof/Black, White leather; Visually maintained, largely original, 3+ condition; Hammered Sold at $29,250 plus commission of 10.00%; Final Price $32,175. With Reserve. – Wheel covers, whitewalls, bench seat with armrest, power steering, power brakes, pushbutton radio, power windows, power seat, Autronic Eye, factory air conditioning. – Represented as matching numbers. Dull original chrome and brightwork. Crack in the nose. Touch up on the passenger’s door. Otherwise good older paint. Very good recent roof vinyl. Unrestored but maintained underneath. Light wear to all of the original interior but there are no major issues and it has a charming mellowed quality to it. Not totally original, but close and a handsome driver. – This is a rare and desirable model bought for a third of the price of a comparable Eldorado convertible. It even has factory A/C and looks elegant in these colors. Given its reassuring condition it could have brought a little bit more, but not so much that this result isn’t fair to both the buyer and the seller. 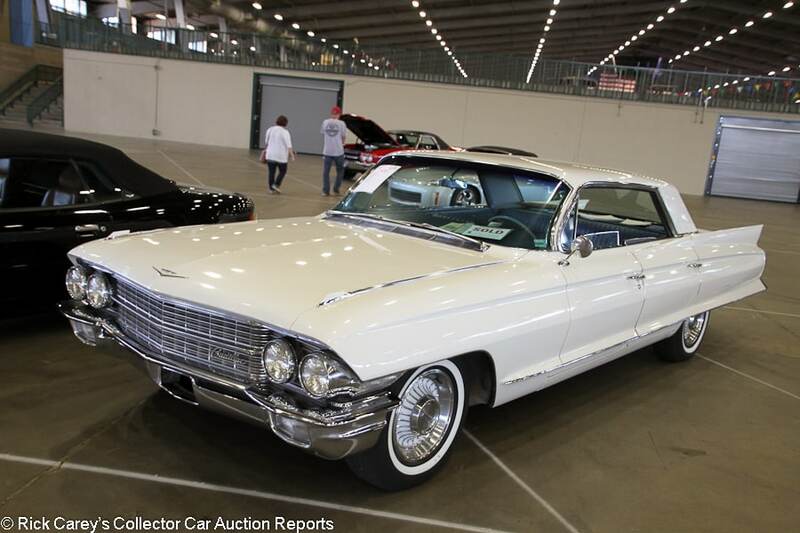 Lot # 177 1962 Cadillac Series 62 4-Dr. Sedan; S/N 62N103007; White/Blue vinyl; Cosmetic restoration, 3 condition; Hammered Sold at $14,000 plus commission of 10.00%; Final Price $15,400. With Reserve. – 390/325hp, automatic, wheel covers, narrow whitewalls, fender skirts, power steering, power brakes, power windows, factory air conditioning, dash clock, later cassette stereo, power seat. – Two-owner car. Decent older paint. Long crack on the right side of the nose. Cracking in the drip rails. Long, splotchy touch ups at the top of the trunk lid. Scuff on the driver’s door. There is some discoloration on the headliner. Very good newer upholstery and dash top. Pretty rough and worn underneath with lots of oxidation and some surface rust, but nothing that looks too major. A handsome car at first glance, but it’s easy to sour on it upon closer inspection. – While this Cadillac may be rough, it also is an honest and reasonably well maintained two owner car that inspires some confidence that it has never been neglected. The Tulsa bidders cottoned on to that and gave it a price that the seller should be pleased with, without paying unreasonably. 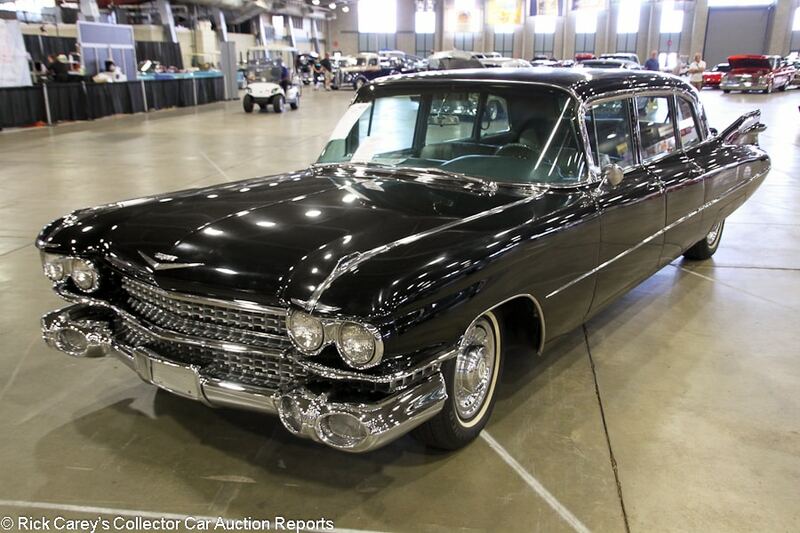 Lot # 423 1959 Cadillac Series 75 Limousine; S/N 59R068628; Black/Gray leather; Older restoration, 2- condition; Hammered Sold at $31,500 plus commission of 10.00%; Final Price $34,650. With Reserve. – Wheel covers, narrow whitewalls, power division window with clock and ashtrays in the back, jump seats, power windows. – The interior looks just about new. Very good older chrome, but the paint is getting a bit tired even if it is free of blemishes. The door gaps are slightly uneven. Older restoration with age that takes little away from the presence and inherent style of these old limos. – Wouldn’t it be a delightful surprise if Lyft sent this, instead of a late model, for a pickup and trip to a social event? The condition is remarkably good for the age of the restoration and the price suggests it might, in fact, have a commercial rationale for the new owner. It brought all it’s worth. Lot # 1209 1931 Chevrolet AE Independence Roadster; S/N 2189441; Brown, Beige fenders/Gray vinyl; Beige cloth top; Older restoration, 2- condition; Not sold at Hammer bid of $25,000. With Reserve. – Wire wheels, hub caps, dual enclosed sidemount spares with mirrors, rumble seat, wind wings. – Really sound older paint. Shiny older chrome. The engine bay is a bit dirty. The top is lightly worn. There’s nothing wrong with this car, it’s just a bit aged. It will stand out in a sea of Fords. – Chevys of this period really stood out from their Ford counterparts with smoother-running 6-cylinder engines, an extra 10hp and more distinctive colors. Even at that, though, this older restored AE Independence could have sold with no regrets at the reported high bid. 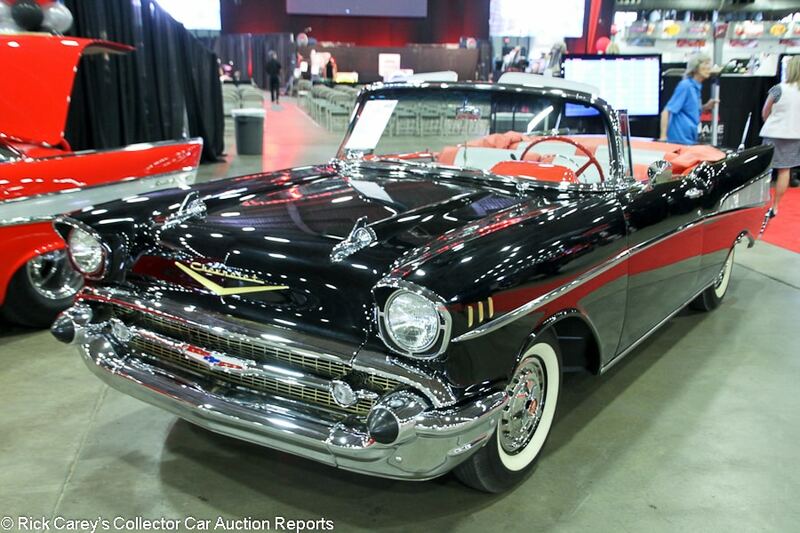 Lot # 468 1957 Chevrolet Bel Air Convertible; S/N VC57F246276; Black/Red, Silver vinyl; Recent restoration, 2 condition; Hammered Sold at $77,500 plus commission of 10.00%; Final Price $85,250. With Reserve. – Dual quads, automatic, spinner wheel covers, whitewalls, dual power antenna, dual quads, power steering, power windows, WonderBar radio, power top, dual mirrors, red vinyl boot cover, dash clock. – Very good paint and chrome. Driver’s door sticks out slightly at the bottom. Excellent interior. Spotless and fresh underneath. Recently restored with barely any test miles on it. A fresh car done to like new but not excessive standards. 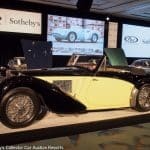 – Offered at Leake’s Dallas auction in December where the high bid was reported to be $80,000. This is a modest result for a dual quad car, even for one lacking any representation that this was the original engine configuration. Lot # 162 2002 Chevrolet Camaro SS 35th Anniversary Convertible; S/N 2G1FP32G222100760; Red, Silver stripes/Black leather; Unrestored original, 2- condition; Hammered Sold at $10,500 plus commission of 10.00%; Final Price $11,550. No Reserve. – 346/325hp, automatic, power top, Monsoon sound system, power windows, air conditioning, traction control. – Big crack at the right front edge of the hood and a few chips on the nose. Light curb rash on the right front wheel. Good original paint otherwise. Good, very lightly worn interior. Clean engine bay. Showing 117,956 miles, but it looks like a car with half that. – The 35th Anniversary Package was a $2,500 option when new, and today they are only worth slightly more than a standard SS. The Tulsa bidders seem to have been dissuaded by the digits on the odometer even though this car has clearly been very well maintained. Without looking at the mileage, it looks like a $15,000 car. Provided it is sound mechanically, the new owner got a great deal. 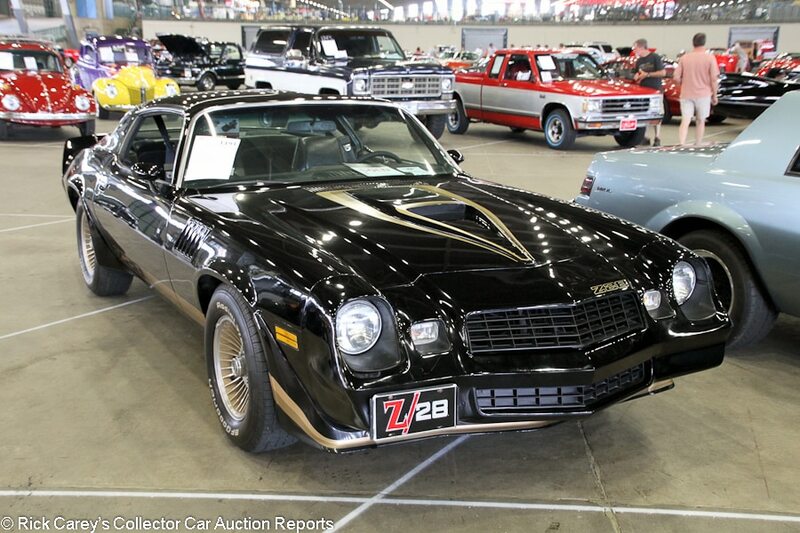 Lot # 1191 1979 Chevrolet Camaro Z/28 Coupe; S/N 1Q87L9L632804; Black, Gold/Black vinyl with cloth inserts; Visually maintained, largely original, 3+ condition; Hammered Sold at $15,100 plus commission of 10.00%; Final Price $16,610. With Reserve. – 350/175hp, 4-speed, Radial T/A tires, glass T-tops, power windows, cassette stereo, 3.73 Positraction, power steering, power brakes, tilt steering column. – A few chips in the nose. Dirty wheels. Good, lightly worn seats. New carpets. Worn switchgear and dull gauges. Tidy underneath. Showing 87,567 miles. A used car, but well equipped for what it is. Finished in Bandit colors, but it’s a Chevy. – Sold for $13,750 at Mecum Kissimmee last year. This slightly higher result was more in line with what this well-kept car deserved without being expensive. 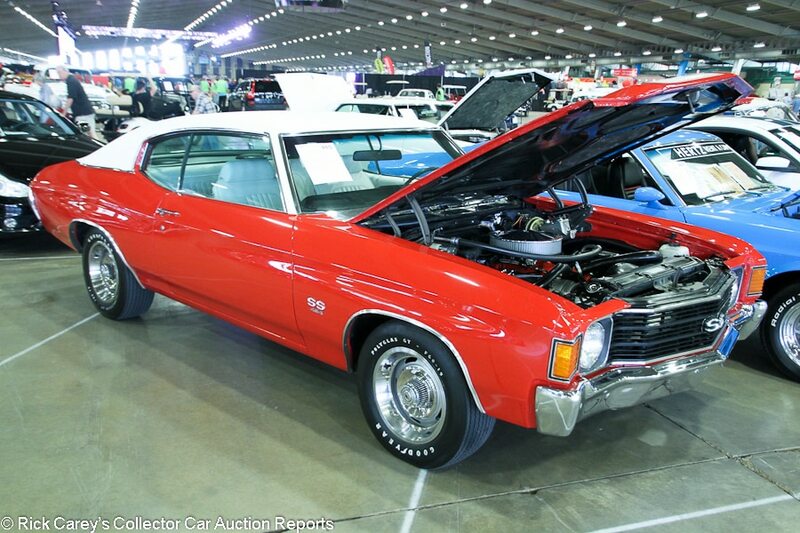 Lot # 485 1972 Chevrolet Chevelle SS 454 Clone 2-Dr. Hardtop; S/N 1D37H2B609454; Red, White stripes and vinyl roof/White vinyl; Modified restoration, 2- condition; Hammered Sold at $38,000 plus commission of 10.00%; Final Price $41,800. With Reserve. – 454/270hp replacing the original VIN-coded 350/165 engine, 4-speed, Rally wheels, Polyglas GT tires, 3.31 Positraction, 12-bolt rear, bucket seats, console, factory air conditioning, power steering, power brakes, Hurst shifter, later cassette stereo. – Tidy engine bay with many new or refinished parts, but it is a bit dirty and there’s grime covering the engine number. Rebuilt engine and transmission. Very good paint and chrome. Very mild discoloration in the roof vinyl but it would probably clean up. Very good interior. Fully restored and lightly used since. – Not sold at a $39,000 high bid at Leake Tulsa in 2015, then for $48,400 at Mecum Dallas in November 2015. It was reported sold for an astounding $77,000 at Leake Dallas this year, but has come back down to earth with this result more appropriate to its not being what it wants to appear to be. 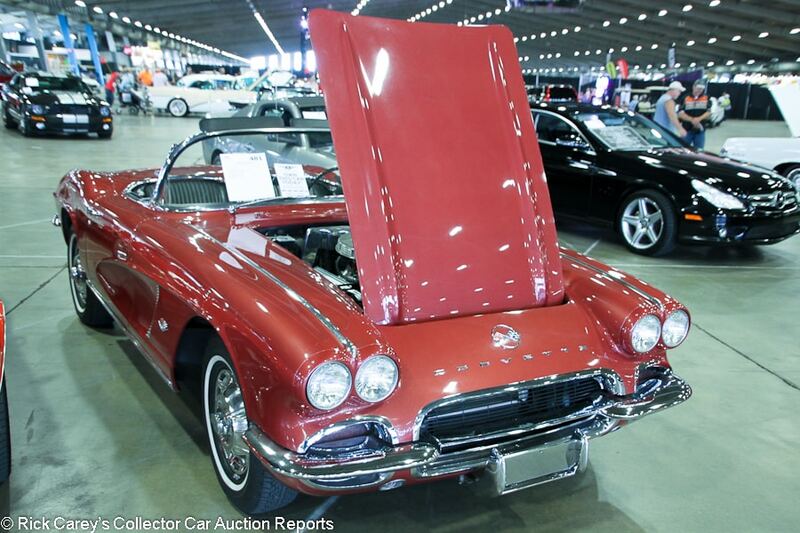 Lot # 481 1962 Chevrolet Corvette Convertible; S/N 20867S113196; Honduras Maroon/Black vinyl; Black top; Enthusiast restoration, 3 condition; Hammered Sold at $47,000 plus commission of 10.00%; Final Price $51,700. With Reserve. – 327/340hp, 4-speed, spinner wheel covers, narrow whitewalls, WonderBar radio, power windows. – Soft top only. Dull paint with scratches around where the hardtop used to fit and a big chip on the right front fender. Body trim is dull and most of it doesn’t fit flush with the body. Clean, well maintained engine bay. Recently serviced. Unrestored but sound interior. Plenty of road wear on the underbody. A few scratches on the wheel covers. An unremarkable final year C1 with nothing in the way of documentation to make up for its lackluster presentation. – Not sold at a $45,000 high bid at Leake Dallas in 2015 but the owner let it go in Tulsa for roughly the same number. Corvette people like paperwork and find it hard to bid enthusiastically on a car with question marks like this, especially if it’s in mediocre condition. It has desirable equipment, but nothing else about it is ideal and it shows in the bids it has received. 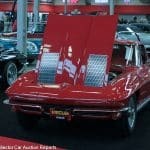 Lot # 2491 1966 Chevrolet Corvette Convertible; S/N 194676S124664; Engine # 6124664; Rally Red/Red leather; Older restoration, 2- condition; Hammered Sold at $57,500 plus commission of 10.00%; Final Price $63,250. With Reserve. – 427/425hp L72 engine, M21 4-speed, alloy centerlock wheels, side exhaust, teakwood steering wheel, side exhaust, leather seats, headrests, Positraction. – Light scuffs on the rear bumper. Sound older paint. Lightly run engine bay and lightly worn interior. No other documentation or certification represented and the block is apparently stamped only with the VIN code, not the Tonawanda engine number. An older body-off restoration, but still very attractive and certainly well-equipped. – Sold for $82,680 at Mecum Kissimmee in 2013, then $77,380 at Houston three months later. The result here is appropriate for a car with questions, as are the consistently skeptical earlier results. 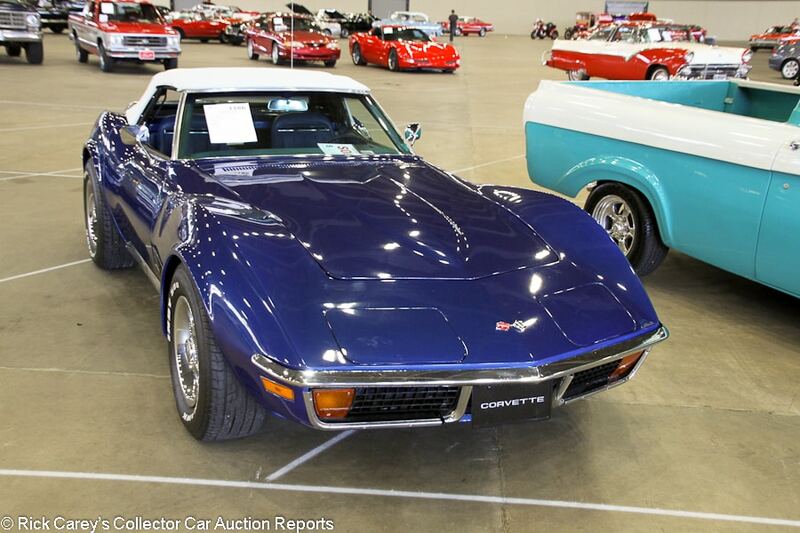 Lot # 1186 1972 Chevrolet Corvette Convertible; S/N 1Z67K2S502978; Targa Blue/Blue vinyl; White vinyl top; Unrestored original, 3+ condition; Hammered Sold at $18,800 plus commission of 10.00%; Final Price $20,680. With Reserve. – 350/200hp, automatic, Rally wheels, luggage rack, power steering, power brakes, factory air conditioning. – Lightly scratched chrome. Big chip above the right headlight door. Large spider cracking on the hood in two spots. Very shiny recently cleaned up wheels. Good newer top. Very good original interior other than worn and faded switchgear. Tidy underneath. An unrestored but unremarkable car for the most part. A driver. 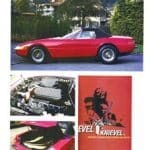 – A straightforward result, but something of a bargain for a reasonably well-equipped example in this condition from the last year the Corvette had chrome bumpers at both ends. Next stop Bloomington Gold? 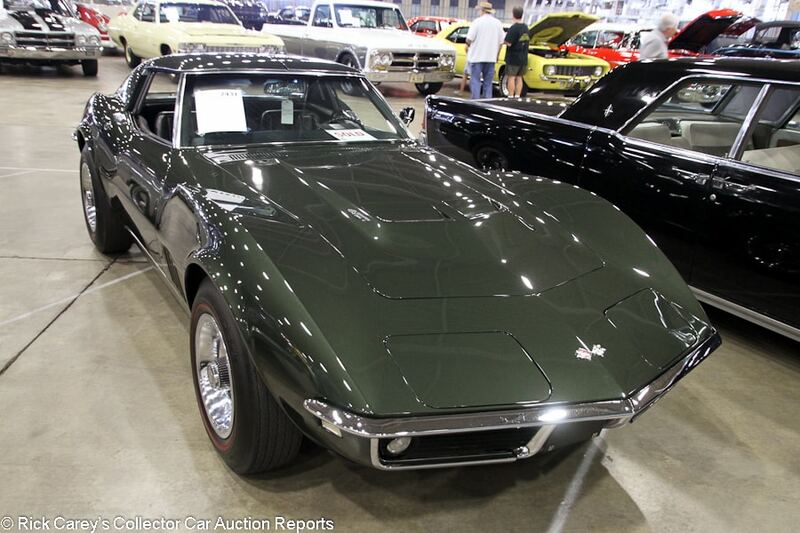 Lot # 2431 1968 Chevrolet Corvette Coupe; S/N 194378S417371; British Green/Black vinyl; Older restoration, 2- condition; Hammered Sold at $40,000 plus commission of 10.00%; Final Price $44,000. With Reserve. – 427/400hp L68 engine, automatic, Rally wheels, red line tires, power steering, power brakes, pushbutton radio. – Represented as matching numbers. Good older paint and chrome. Good, lightly worn interior. Restored underneath. Never done to show standards and lightly enjoyed, but an attractive straightforward older restoration. – And it’s a straightforward restoration that went for a straightforward price that is all but indistinguishable from the $43,450 it sold for at Leake’s Dallas auction in 2013. 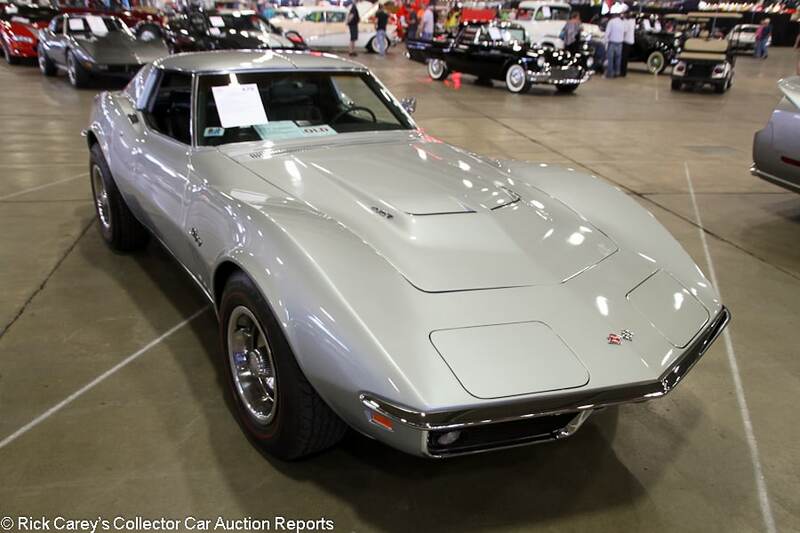 Lot # 479 1969 Chevrolet Corvette Coupe; S/N 194379S727066; Engine # 19S727066; Cortez Silver/Black vinyl; Older restoration, 3+ condition; Hammered Sold at $32,000 plus commission of 10.00%; Final Price $35,200. With Reserve. – 427/400hp, Hydra-Matic, Rally wheels, red line tires, power steering, power brakes, power windows, tilt and telescopic steering column. – Very good chrome. Decent paint with lots of detail swirls. Light scratches and a few small dents in the tops of the window frames. Very dull and worn original switchgear. Replacement upholstery and carpets are very good. Represented as a ground-up restoration, but it was done a while ago and stones were certainly left unturned to the extent it might well be described as only cosmetically restored. – Not sold at a $31,000 high bid at Mecum Anaheim in 2013. Not sold again at a $25,000 high bid at Leake Tulsa in 2015, then not sold one more time at Leake OKC back in February at a $32,000 high bid. Multiple identical offers have a way of adjusting sellers’ expectations for their cars, and this car still went to a new home for no less than what it really deserved. 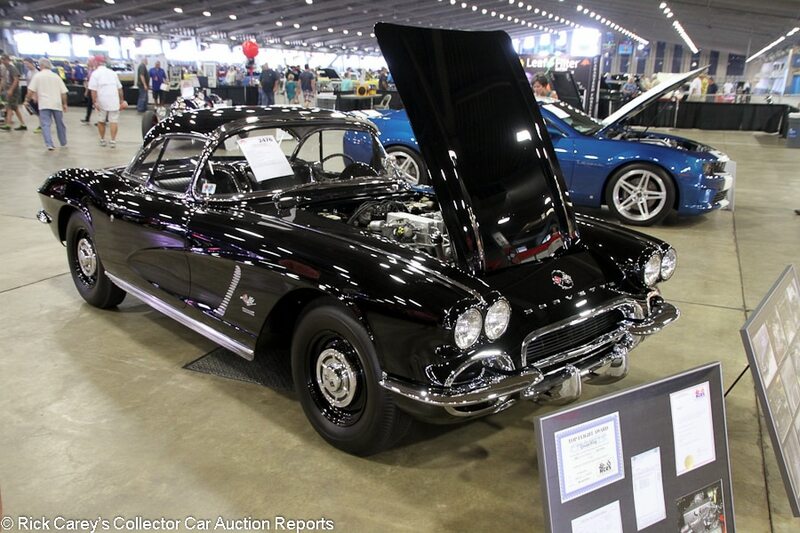 Lot # 2476 1962 Chevrolet Corvette FI Convertible; S/N 20867S109639; Black, Black hardtop/Black vinyl; Black vinyl top; Recent restoration, 2+ condition; Not sold at Hammer bid of $75,000. With Reserve. – 327/360hp fuel injection, 4-speed, hub caps, blackwall tires, both tops, Positraction, metallic brakes, off-road exhaust. – NCRS Top Flight in 2012. Judged to 97.3 points. Spotless engine bay. Very good paint and chrome. Spotless interior. Light scratches on the rear window frame of the hardtop. Still a show car but no representation of the drivetrain’s originality in this chassis. – Sold for $97,200 at Leake Dallas in 2014. It only takes a short time looking at this very well done Fuelie that it’s a six-figure car, and it has two prior transactions to prove it. The reported high bid was short by quite a bit. 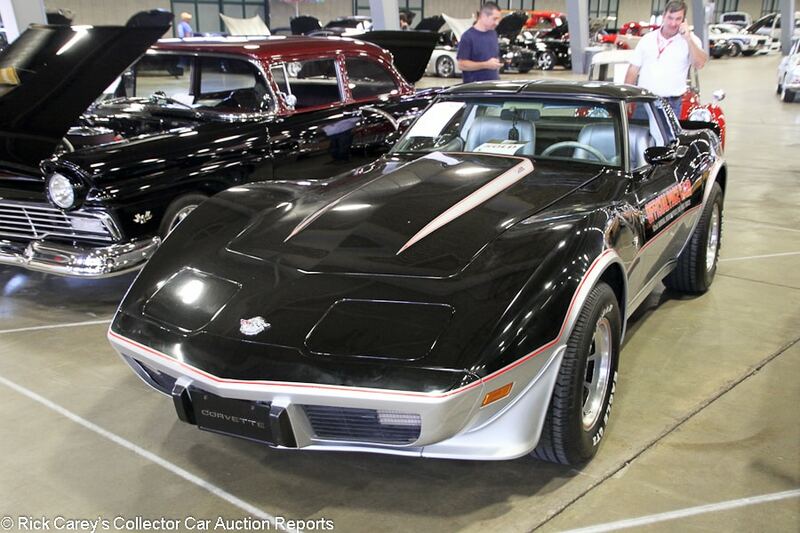 Lot # 521 1978 Chevrolet Corvette Pace Car Coupe; S/N 1Z8748S901125; Black, Pace Car graphics/Silver; Unrestored original, 3 condition; Hammered Sold at $21,500 plus commission of 10.00%; Final Price $23,650. With Reserve. – 350/220hp L82 engine, automatic, power steering, power brakes, power windows, glass T-tops, factory air conditioning, 8-track stereo with CB, tilt/telescopic steering column. – Redone suspension. Comes with another complete set of decals. A few light scratches in the nose. Crack on the right headlight door. Long scratch to the right of the hood. Tidy underneath. The paint finish is dull. Very worn steering wheel. Slightly discolored carpets. Light wear to the seats. This should really be a better car given the 4,393 miles showing that are represented as actual, and especially compared to the other mothballed ’78 Pace Cars out there. – Pace Cars can be worth twice as much as an ordinary ’78 ‘Vette, but collectors want the cars that are time-warp examples in essentially like-new condition and many of the 6,500 built are that well-kept. Serious collectors, then, probably will have discounted this car’s aged condition while people who want a driver C3 don’t want to pay the premium for the Pace Car decals. Factory paint jobs on these cars were notoriously poor and most, even those with minimal miles, were repainted under warranty. Preservation purists might value the original paint on this Pace Car, but for regular use it is unattractive. That’s where the new set of decals comes in. 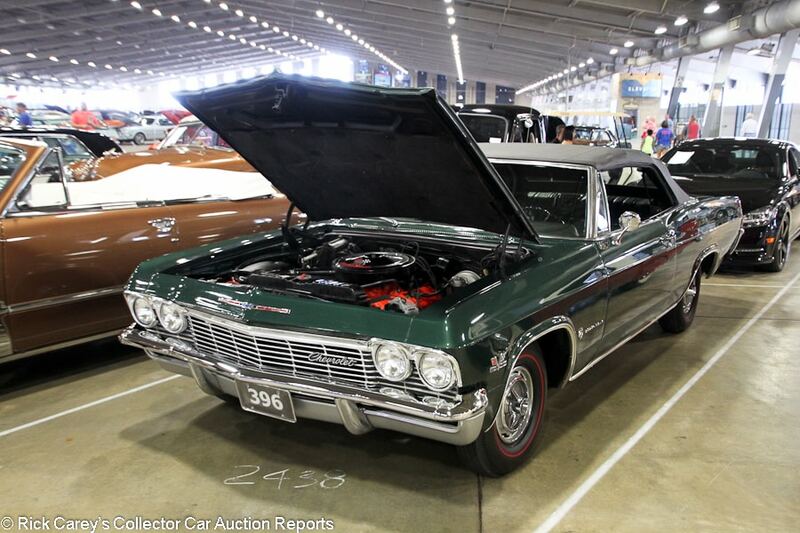 Lot # 803 1965 Chevrolet Impala Convertible; S/N 164675T197936; Dark Green/Black vinyl; Black vinyl top; Older restoration, 3+ condition; Hammered Sold at $25,250 plus commission of 10.00%; Final Price $27,775. No Reserve. – 396/325hp, 4-speed, wheel covers, US Royal red line tires, added air conditioning, power brakes, power windows, power top, bench seat, floor shift, pushbutton radio, rear seat speaker. – The engine number is too dirty to read, but the rest of the engine bay is tidy if fairly used. The paint finish is shiny but has some fisheyes in it. The top is older but good. There are chips around the edges of the trunk, which fits erratically and has a few small dents. The rest of the panel gaps are slightly uneven. The window frames are scratched up. Good interior with newer seats and carpets but sound original dash and steering wheel other than faded gauges. Older restored underbody. A car that’s gotten restoration work but doesn’t seem to have ever been fully taken apart. In better than average driver condition, but still a driver nonetheless. – This car was reported sold at Mecum Kissimmee in January 2016 for a paltry $10,175, then scored big time at Barrett-Jackson Northeast five months later $29,700. It was a no-sale here on Saturday as #2439 on a $23,000 high bid, then sold Sunday without reserve with this result.. All the results are reasonable for a car with this equipment and in this condition, and the higher Barrett-Jackson transaction can be chalked up to there simply being more bidders in the room in a new and high energy venue. 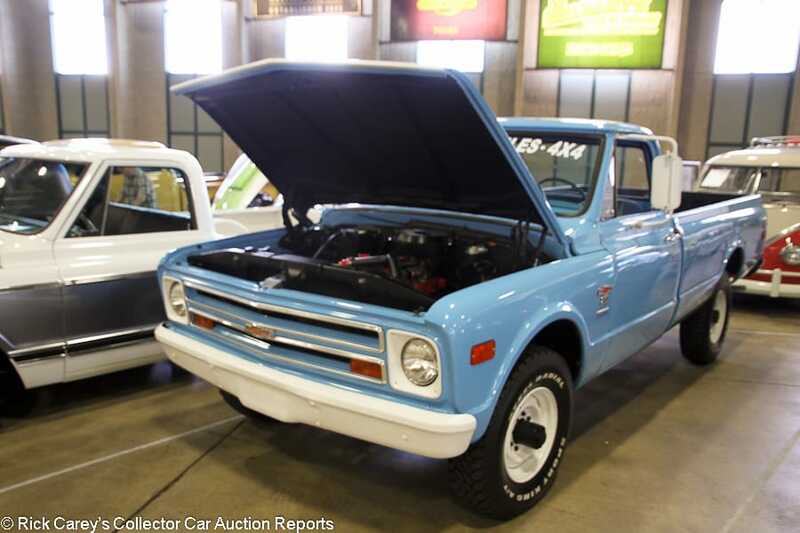 Lot # 808 1968 Chevrolet K20 Fleetside Pickup; S/N KS248T100899; Light Blue, White/Light Blue; Truck restoration, 2- condition; Not sold at Hammer bid of $12,250. With Reserve. – 292/170hp six, automatic, mirrors, 8-foot bed, 4WD, spray-in bed liner, pushbutton radio. – “Date code correct” replacement engine. Tidy, lightly used engine bay. Undercoated frame, but not fully restored underneath. The bed was crudely done but it isn’t bad. Very good paint. Good interior. An attractive pickup done on a truck budget. – A truck to be enjoyed and gently used for chores, but worth no more than what was bid for it today. 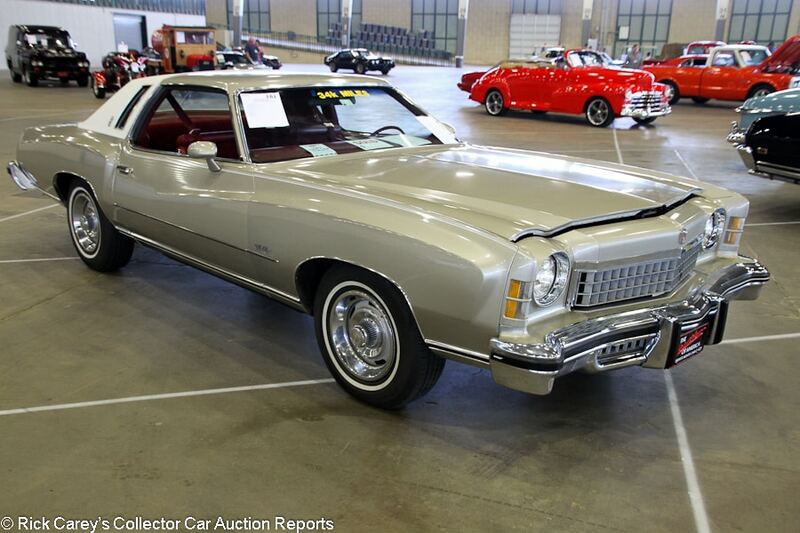 Lot # 181 1974 Chevrolet Monte Carlo Landau 2-Dr. Hardtop; S/N 1H57H4B553019; Beige, White vinyl roof/Red vinyl and cloth; Visually maintained, largely original, 3 condition; Hammered Sold at $8,000 plus commission of 10.00%; Final Price $8,800. With Reserve. – 350/145hp, automatic, rally wheels, narrow whitewalls, factory air conditioning, power steering, power brakes, tilt steering column, tinted glass, bench seat, column shift. – Grimy, tired-looking unrestored engine bay. Several big chips on the nose. The finish of the original paint is a bit dull otherwise, but those are the only blemishes. Dull chrome and brightwork. Decent, lightly worn underbody. Very good interior other than cracks in the vents on the dash top. Unrestored and a bit tired, but a decent cruiser. – A straightforward result for a basic car. 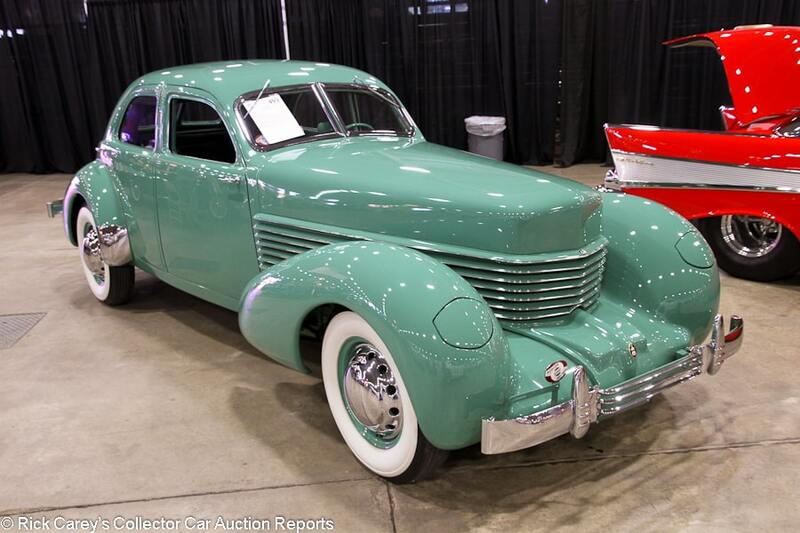 Lot # 493 1937 Cord 812 Sedan Westchester; S/N 1471A; Green/Dark Green cloth; Older restoration, 2- condition; Hammered Sold at $70,000 plus commission of 10.00%; Final Price $77,000. With Reserve. – Pre-Selector, wheel covers, wide whitewalls, engine-turned dash. – CCCA winner in 1992, according to a badge on the body. Very good older paint that is slightly swirling on the front. Even gaps. Flawless interior. Reportedly restored over a 23-year period. One of very few known with the bustle-back trunk. – A post-block sale at Branson Spring in 2012 for $65,100, then sold there six weeks ago for $62,150 making this a decent quick turn for the consignor but with nothing left at this price but enjoyment for the new owner. 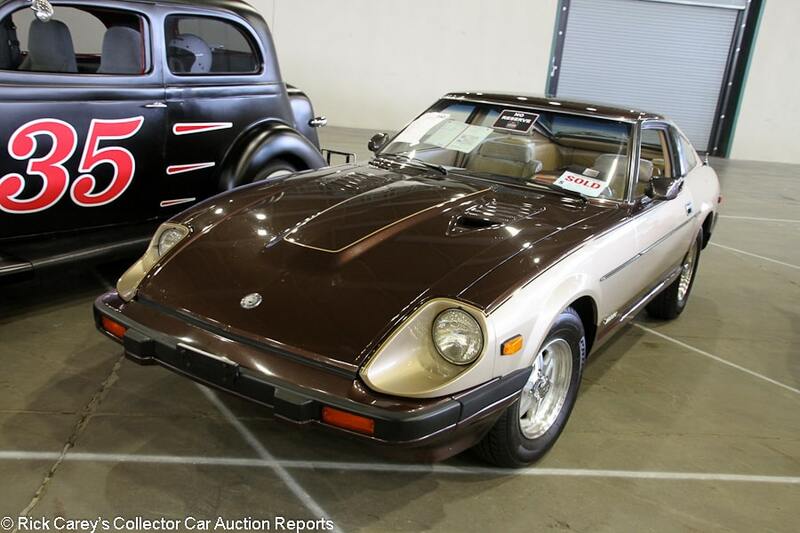 Lot # 160 1983 Datsun 280ZX Coupe; S/N JN1HZ04S9DX559454; Brown, Gold/Beige cloth; Unrestored original, 3+ condition; Hammered Sold at $8,900 plus commission of 10.00%; Final Price $9,790. No Reserve. – Power steering, power brakes, air conditioning, cassette stereo, cruise control, power windows, power mirrors. – Chips all over the hood and even what looks like sap. Scratched up wheels. Good interior and tidy underbody. Showing 75,046 miles. Every bit a car of its time in these colors, it’s a well-kept ZX let down by damaged paint and an unfortunate transmission choice. 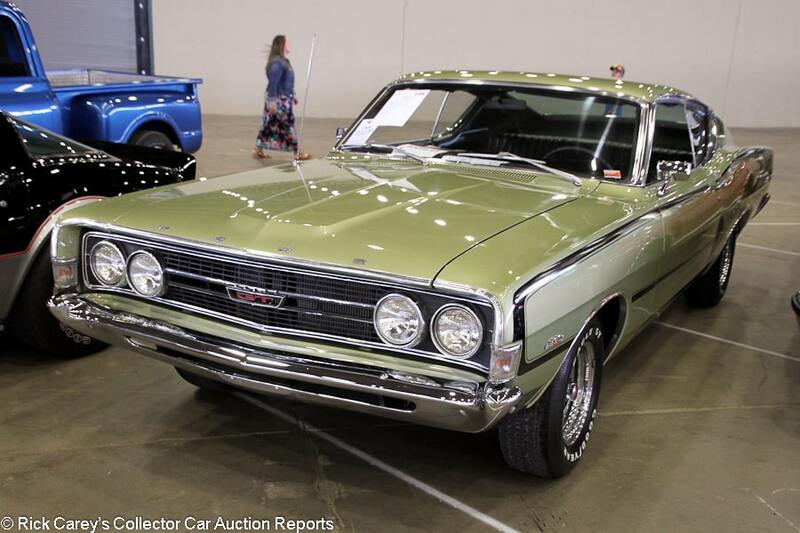 – Sold for $8,250 at Mecum’s KC auction in March, then not sold at a reported high bid of $12,000 early at Mecum Houston a month later but then no-saled later that weekend on a $7,000 bid. That someone would refuse $12,000 (or bid that much) for this car is hard to comprehend, but the seller should still be thrilled with this result for an unremarkable, automatic-equipped Z-car. 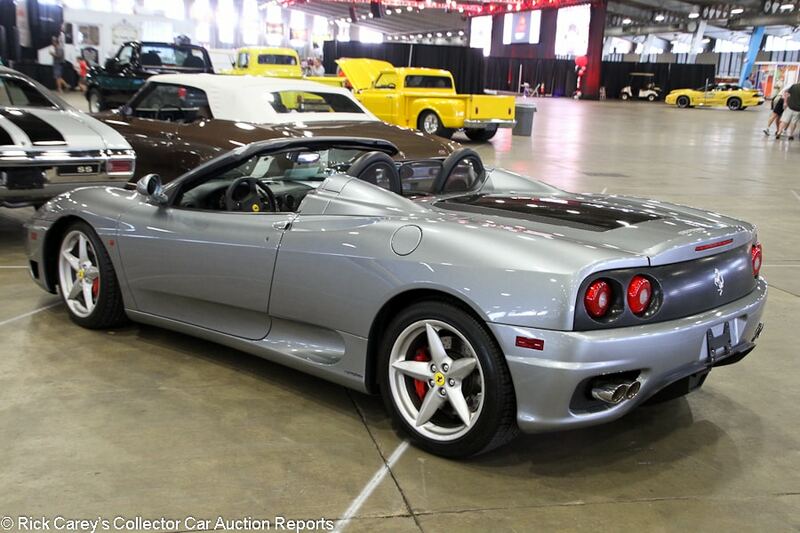 Lot # 2461 2005 Ferrari 360 Spider Convertible, Body by Pininfarina; S/N ZFFYT53A950140066; Silver/Red leather; Unrestored original, 2 condition; Not sold at Hammer bid of $70,000. With Reserve. – Alpine CD stereo, Pirelli tires, air conditioning, power seats, carbon fiber trim, power windows, books, manuals, tools, car cover. – Very light wrinkling on the driver’s seat. Otherwise, it looks like a new car. Represented with service records since new. – Not sold at a $77,000 high bid at Mecum Houston this year. 360 prices have been slowly waning over the past year but this car deserves over 80 grand, particularly in unusual and showy silver over red leather. The owner can’t be faulted for holding out for a bit more. Lot # 901 1993 Ferrari 512 TR Coupe, Body by Pininfarina; S/N ZFFLG40A1P0096404; Black/Tan leather; Unrestored original, 2- condition; Not sold at Hammer bid of $135,000. With Reserve. – Aftermarket aluminum wheels, power windows, air conditioning, Tubi exhaust, tool kit. – Swirls in the paint. Engine bay isn’t spotless but it is clean. Very lightly worn interior. Showing 16,238 claimed original miles. 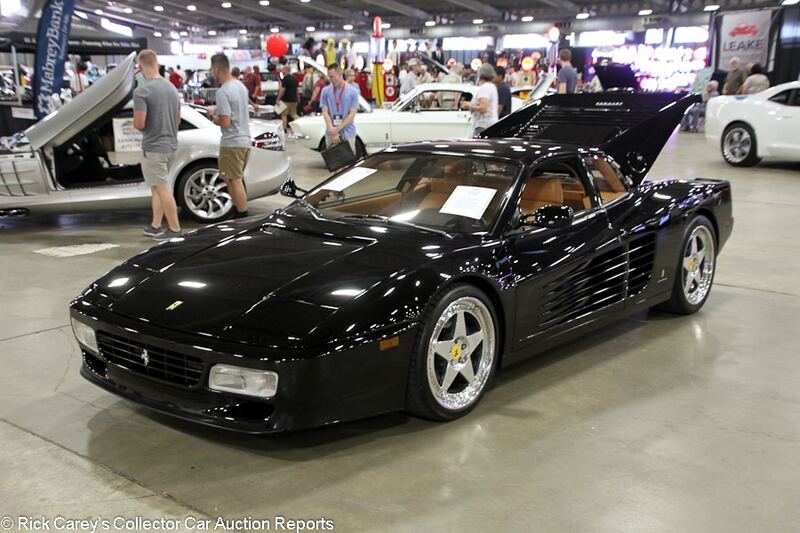 A used Testarossa. – This 428hp 512 TR is worth a lot closer to 200 grand, but there just wasn’t enough money in the room in Tulsa to get it there. 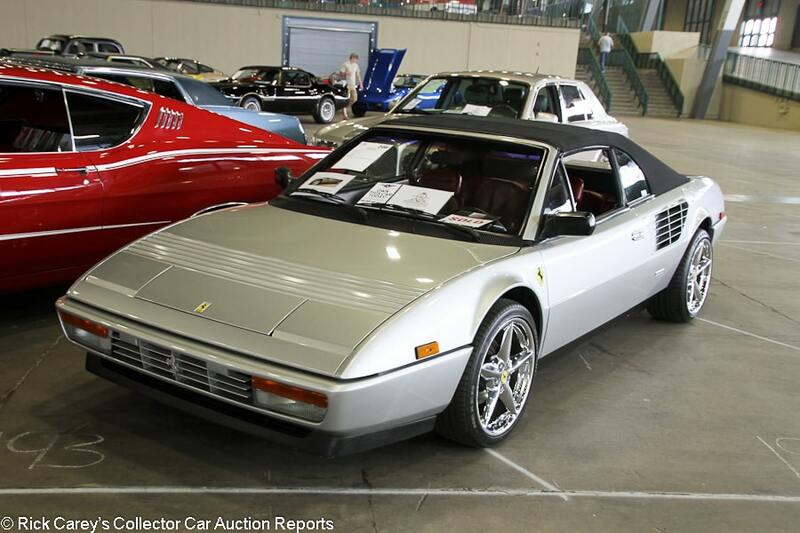 Lot # 208 1988 Ferrari Mondial 3.2 Cabriolet; S/N ZFFXC26A7J0075718; Silver/Red leather; Black cloth top; Visually maintained, largely original, 2- condition; Hammered Sold at $29,500 plus commission of 10.00%; Final Price $32,450. No Reserve. – Store brand tires, chromed wheels from a later 360 model, Momo leather-wrapped steering wheel, power steering, power windows, air conditioning, Blaupunkt CD stereo. – Good paint other than some chips at the back of the driver’s door. There are some light creases and discoloration in the top. Good, very lightly worn interior. In solid shape for a Mondial. Showing 23,171 claimed original miles. – Sold for $28,600 at Barrett-Jackson Palm Beach in 2012, then sold for $28,875 at Leake Tulsa in 2015. Those were both strong results for a Mondial at the time but Ferrari prices, even for the less beloved like the Mondial, have caught up and this is an appropriate result for this one today. 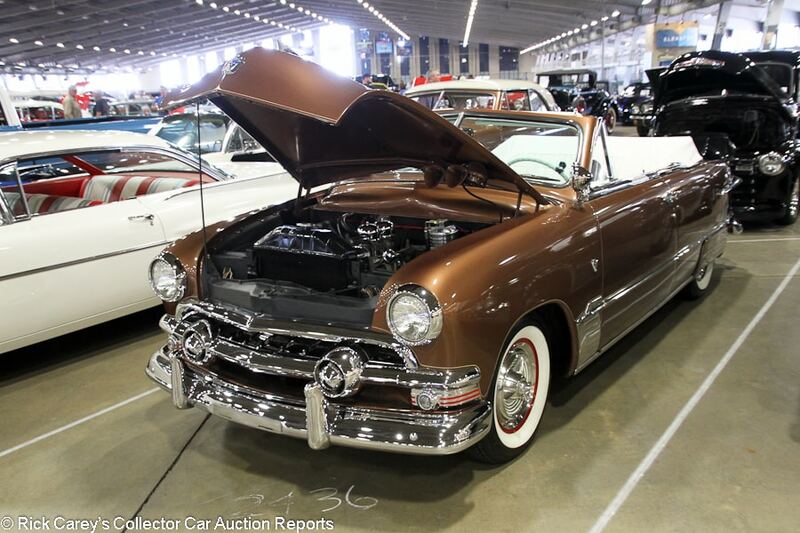 Lot # 2436 1951 Ford Custom Convertible; S/N B1DL151818; Metallic Brown/White; White top; Modified restoration, 2- condition; Hammered Sold at $26,000 plus commission of 10.00%; Final Price $28,600. With Reserve. – Wheel covers, whitewalls, dual spotlights, fender skirts, overdrive 3-speed, French Flathead engine, white vinyl boot cover, dual carb Offenhauser intake, Edelbrock heads, radio, dash clock. – Nearly spotless engine bay. Very good paint and chrome other than light scuffs on the rear bumper. Even gaps. Slight discoloration on the white seats but the interior is mostly very attractive. An older restoration but an attractive car that really grabs your attention and has tasteful period correct mods. – This is a sweet modified Ford with a load of correct period modifications in really good, if older, condition and it brought a moderate price consistent with its condition but also offering the new owner exceptional satisfaction. It’s a car that can be owned and regularly exercised with satisfaction both for what it is and for how reasonably it was bought. 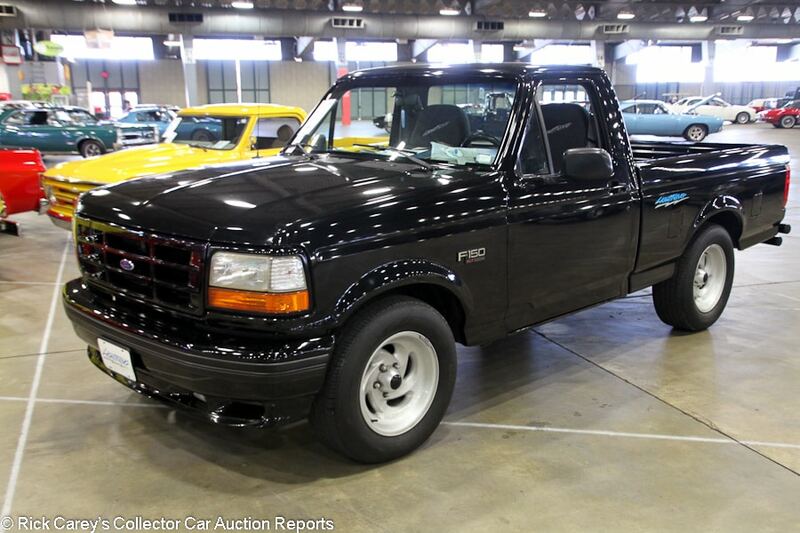 Lot # 2425 1995 Ford F-150 SVT Lightning Pickup; S/N 1FTDF15R2SLA87060; Black/Gray cloth; Unrestored original, 2- condition; Hammered Sold at $19,000 plus commission of 10.00%; Final Price $20,900. With Reserve. – 351/240hp, automatic, alloy wheels, bucket seats, column shift, cassette stereo, power windows, air conditioning. – Three owners from new. A few chips in the nose and light swirling throughout but the original paint is sound and shiny. Very clean but used engine bay and underbody. The interior looks just about new. The finish in the bed is dull and there are scuffs and scratches, so it has at least hauled a few things back there. This Lightning isn’t quite like new, but it’s close. – Along with the ’93 Cobra Mustangs, the Lightning was the first vehicle produced by Ford’s Special Vehicle Team (SVT), so these are fairly significant trucks even if they currently don’t command the same attention from collectors as the Syclone/Typhoon from rival GMC. With the general rise in ’90s vehicles as well as collectible trucks, though, these can’t be underappreciated for long. And if this very strong result is any indication, they’re already on the way up. Lot # 2440 1957 Ford Fairlane 500 Skyliner Convertible; S/N D7DC179719; Red, White/Red, White vinyl; White vinyl top; Older restoration, 3+ condition; Hammered Sold at $31,500 plus commission of 10.00%; Final Price $34,650. With Reserve. – 312/245hp, automatic, wheel covers, whitewalls, fender skirts, hood ornament, power steering, power brakes, power top, heater, radio, dash clock. – Recently cleaned up but used engine bay. A few scuffs on the bumpers but shiny chrome and brightwork. Rocker trim doesn’t fit flush with the body. Very good older paint other than a long crack behind the driver’s side door. Lightly worn older restored interior. Good, straight top but it’s lightly discolored. Whitewalls are yellowing. An older high-quality restoration with no major needs but starting to show significant age. – Sold at Auburn Spring in 2003 for $27,666 and now showing just under a thousand more miles on the odometer but otherwise in essentially the same condition. $7,000 more in fourteen years is not the stuff of “investment” dreams, but someone along the way got a few miles of enjoyment out of it, and that counts for a lot. 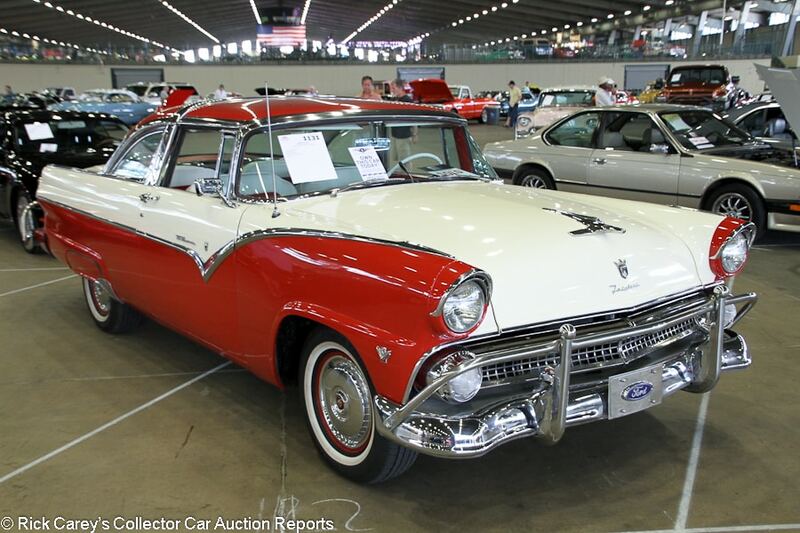 Lot # 1131 1955 Ford Fairlane Crown Victoria 2-Dr. Sedan; S/N U5FW153143; Red, Beige/White, Red vinyl; Older restoration, 3 condition; Hammered Sold at $15,750 plus commission of 10.00%; Final Price $17,325. With Reserve. – 4-barrel added to the 272/162hp engine, automatic, wheel covers, skirts, grille guard, narrow whitewalls, Continental kit, CD stereo but original pushbutton radio still in place, Sunroc under dash gauges, heater, aluminum radiator. – Dirty tires. Lightly scratched bumpers. Lightly pitted grille. Several light but long scratches in front of the passenger’s door. Small dents in the right rear body side trim. Discoloration on the tops of the rear seats. Paint is chipping off the steering wheel rim. Tidy and restored underneath. This car received a pretty thorough restoration at some point, but that was years and years ago. – Sold here last year for $15,125. It’s a lot of style and car for the money at this price, even if it isn’t perfect. 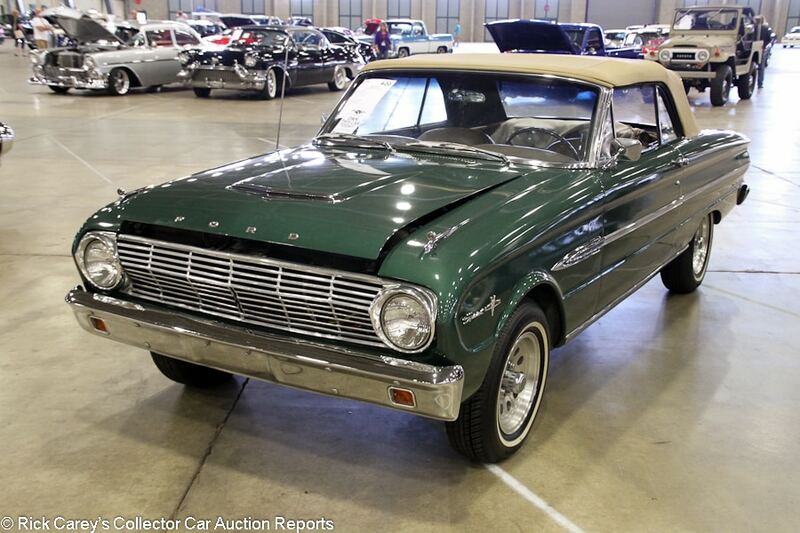 Lot # 420 1963 Ford Falcon Sprint Convertible; S/N 3H15F233449; Green/Tan vinyl; Tan vinyl top; Visually maintained, largely original, 3 condition; Not sold at Hammer bid of $8,750. With Reserve. – 260/164hp, 4-speed, narrow whitewalls, power steering, disc brakes, headers, bucket seats, console, factory radio. – Recent paint and upholstery. New clutch. Dull, lightly scratched older chrome and brightwork. Average quality repaint. Body side trim doesn’t fit flush. There are some scuffs at the bottom of the convertible top. Big scrape on the rear bumper. Good newer seats, but the rest of the interior is original and looks every bit of 54 years old. Sound but unrestored underneath. A neat little car, but no better than a driver. – The first generation Falcon Sprint provided the platform for the first Mustangs, and the convertible models are fairly rare with less than 5,000 built. This one may be far from perfect, but it deserved considerably more than the reported high bid and refusing it was entirely justified. 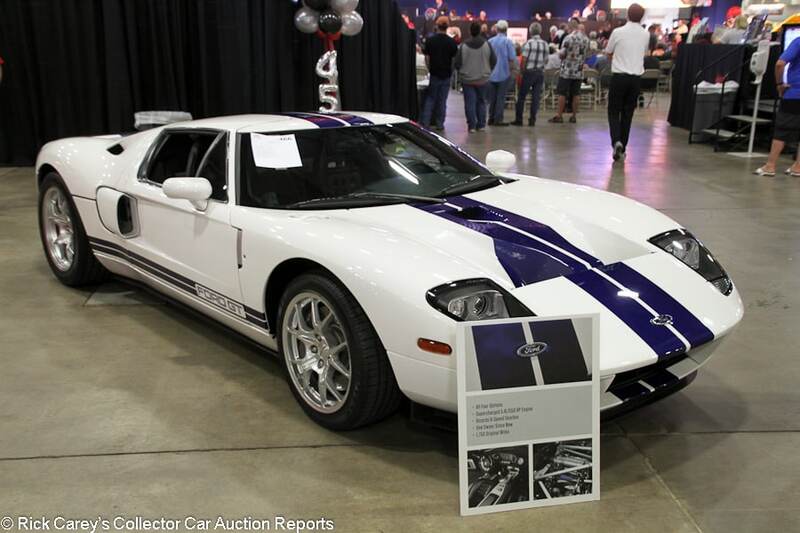 Lot # 466 2006 Ford GT Coupe; S/N 1FAFP90S66Y401662; White, Blue stripes/Black; Unrestored original, 2 condition; Hammered Sold at $277,500 plus commission of 10.00%; Final Price $305,250. With Reserve. – Eagle F1 tires, BBS wheels, McIntosh stereo, painted calipers. – Represented with 1,754 actual miles. Looks like a new car, just like pretty much every other GT out there. – The run upward in GT values seemed like it wasn’t going to end, but they’ve flattened out more recently. Just about all of the cars are in the same condition and have low mileage, and most recent results have been in the high 200s or low 300s like this. It sold at Mecum’s Monterey auction in 2015 for $297,000 and the consignor made the wise decision to move it on at this modest loss rather than wait for the market to drop some more. 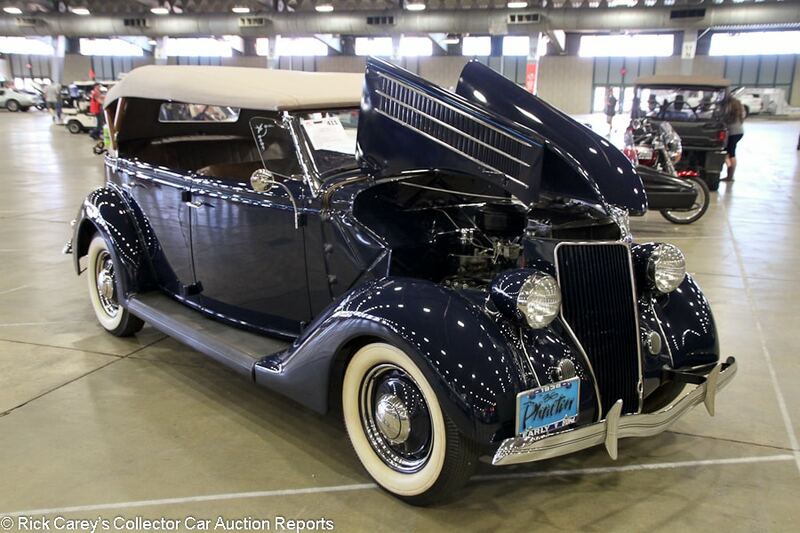 Lot # 411 1936 Ford Model 68 Phaeton; S/N 182722812; Dark Blue/Brown leather; Tan cloth top; Older restoration, 2- condition; Hammered Sold at $25,000 plus commission of 10.00%; Final Price $27,500. With Reserve. – Fenton headers, hub caps and trim rings, wide whitewalls, dual mirrors, wind wings, banjo steering wheel, wood dash, rear-mounted spare. – Discolored whitewalls. Sound older paint. Lightly run engine bay. Some smudges in the top. Light road wear underneath. Excellent interior. A solid older body-off restoration. New tires would make a huge difference in the presentation. – The lightweight 4/5-place Phaeton is one of the more unusual Ford V8 bodies, more stylish than the mundane touring car and more practical that the more sporting roadster or convertible. It’s also rare, with only 5,555 built. Appreciated by collectors and Ford enthusiasts, this is a quality older restoration that brought a realistic price. 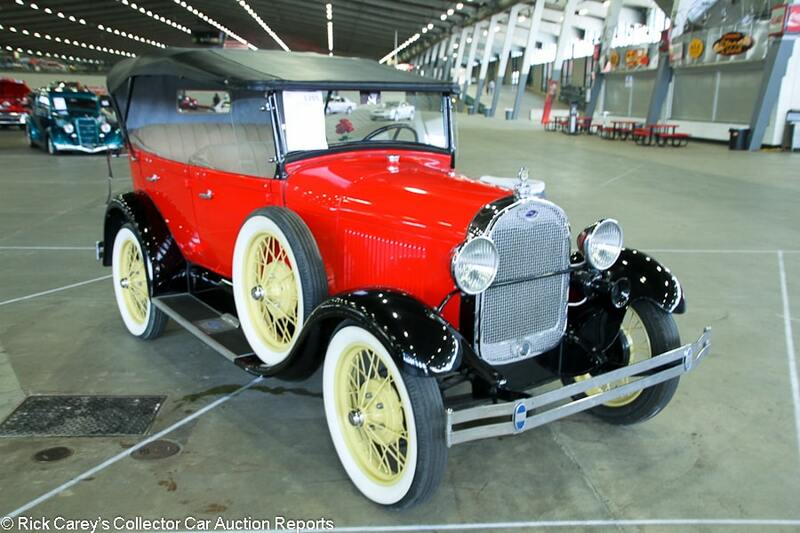 Lot # 1205 1928 Ford Model A Phaeton; S/N CA865075; Red, Black fenders/Beige cloth; Black vinyl top; Enthusiast restoration, 3+ condition; Not sold at Hammer bid of $13,500. With Reserve. – Wire wheels, hub caps, rear luggage rack, wind wings, Boyce Motometer, dual sidemount spares. – Two big cracks in the glass rear window. Leaking a lot of coolant. Older average quality respray with no blemishes except for major discoloration behind the driver’s door. Good interior. Tidy underneath. Basic restoration of a basic car, but a Model A is timeless and charming. – Cataloged as a Convertible Sedan (which Ford didn’t offer until 1931) this is actually a Phaeton. It was worth more than the reported high bid. Lot # 2480 1966 Ford Mustang GT 2-Dr. Hardtop; S/N 6F07A266303; Green/Beige vinyl; Recent restoration, 2 condition; Hammered Sold at $24,000 plus commission of 10.00%; Final Price $26,400. With Reserve. – A-code 289/225hp, 4-speed, red line tires, GT package, air conditioning, front disc brakes. – Tidy, lightly run restored engine bay and underbody. Very good paint, chrome and interior. A straightforward, very good restoration on a charming car, supposedly finished just 2,181 miles ago and probably not an original GT. 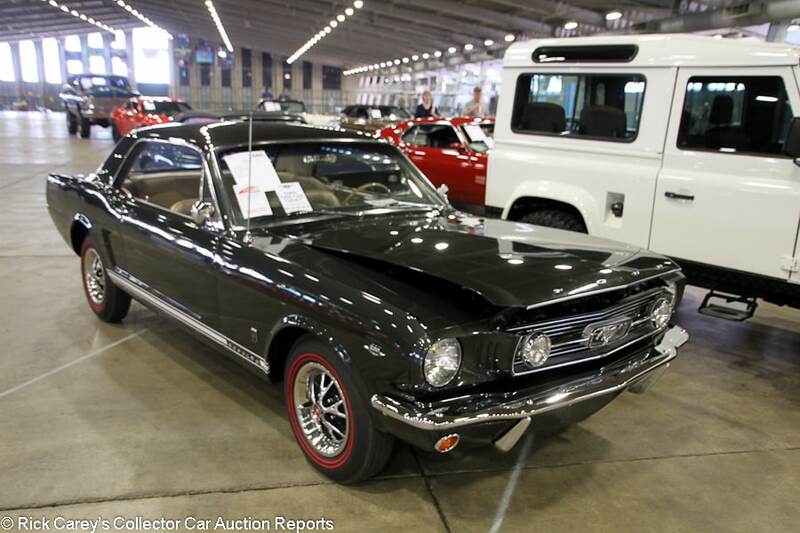 – You never have to look very far to find a good vintage Mustang, even one with desirable equipment, but although this one was bought for average money, it’s a significantly better than average car and a good buy at this price. 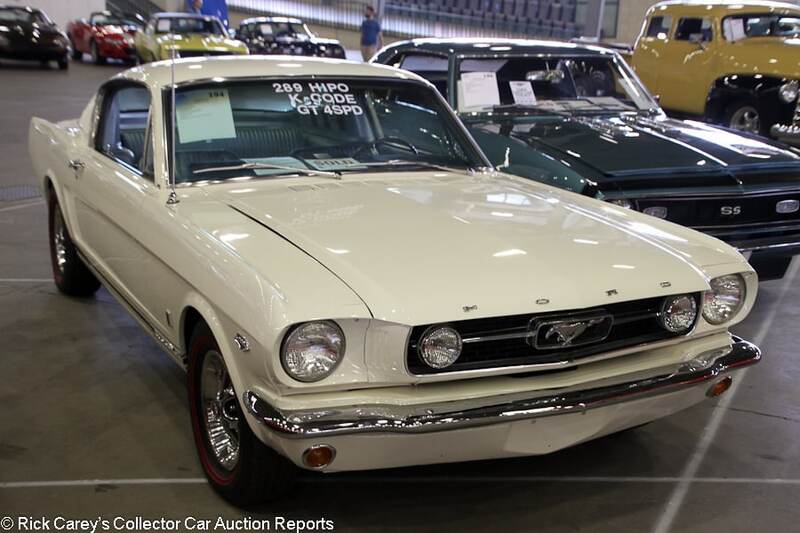 Lot # 194 1966 Ford Mustang GT Fastback; S/N 6F09K192549; Wimbledon White/White, Light Blue vinyl; Older restoration, 2- condition; Hammered Sold at $45,000 plus commission of 10.00%; Final Price $49,500. With Reserve. – Red line tires, K-Code 289/271hp engine, 4-speed, GT package, Pony interior, Rally gauges, factory radio. – With the same family until this year. Lightly scratched front bumper. A few chips on the nose but mostly very good paint. Factory gaps. Very good, mostly restored interior. Tidy and lightly used underneath. An attractive, impressively equipped GT restored a while ago and showing the restoration’s age, but also its quality. – While not perfect, this car is quite charming and correct, plus it has just about everything you’d want in a ’66 Mustang. This was a reasonably appropriate result, but it could have brought another five grand or so without being expensive. 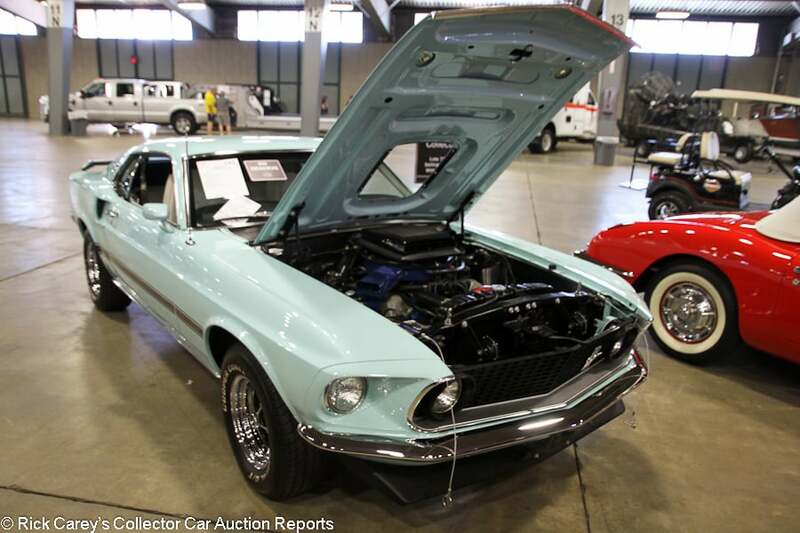 Lot # 742 1969 Ford Mustang Mach 1 SportsRoof; S/N 9R02R147015; Aztec Aqua, Black/White vinyl; Recent restoration, 2 condition; Hammered Sold at $66,000 plus commission of 10.00%; Final Price $72,600. No Reserve. – 428/335hp, automatic, Magnum 500 wheels, Cooper Cobra tires, shaker hood, hood pins, dual mirrors, spoilers, rear window slats, dash clock, Philco radio, 3.5 Traction-Lok, power brakes. – Very clean engine bay with only light signs of wear. Gorgeous paint, chrome and interior, although the gauges and rear upholstery are original. Small chip in the rear spoiler. Even gaps. Done to essentially like new condition and showable. Lots of desirable equipment, Marti Report and window sticker documented. – Sold for $66,000 at Mecum Dallas last year. This result is again appropriate to the quality of its restoration and its attractive colors, but given the fees associated with auction transactions, the seller went home several thousand dollars short of what was in it. 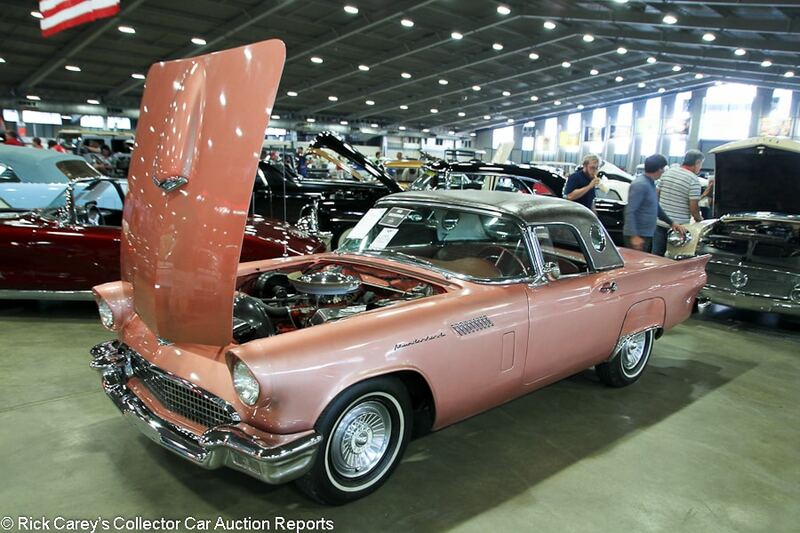 Lot # 728 1957 Ford Thunderbird Convertible; S/N D7FH228258; Dark Rose, Brown vinyl hardtop/Brown vinyl; Cosmetic restoration, 3 condition; Hammered Sold at $23,000 plus commission of 10.00%; Final Price $25,300. No Reserve. – 312/245hp, automatic, wheel covers, narrow whitewalls, porthole hardtop that is covered with vinyl, fender skirts, dual mirrors, Town & Country radio. – From the HG Ground collection. Unrestored but maintained engine bay and underbody. Decent possibly original paint with rub through and discoloration on the body sides and tail. Very good interior that looks restored. No represented history. It’s a barely presentable driver, but doesn’t have originality to make up for it. – Sold for $22,000 at Mecum Dallas last year and turned over here for substantially the same price. Two-seat T-birds in comparable neglected condition have been showing up frequently recently and bringing prices like this. Lot # 144 1968 Ford Torino GT Fastback; S/N 8A42S153873; Lime Gold, Black/Black vinyl; Older restoration, 2- condition; Hammered Sold at $21,000 plus commission of 10.00%; Final Price $23,100. With Reserve. – 390/325hp, 4-speed, Eagle ST tires, Magnum 500 wheels, dual mirrors, AM pushbutton radio, power steering, power brakes, 3.25 axle, Hurst shifter, bench seat, Deluxe Marti report. – Represented as matching numbers. New intake, aluminum radiator and Holley carb. Chip out of the black stripe on the right side. Odd discoloration on the front left of the hood. Otherwise, the older paint is good. Lightly scratched window frames. Good restored interior. Restored and lightly worn underneath. An older restoration in better than average driver condition. – Not a 428, but for all practical purposes the S-code 4-barrel 390, rated just 10hp less than the 428, is a strong, healthy engine that is plenty powerful enough for a weekend driver. This is a responsible result for both the buyer and the seller, but inherently a sweet car for not a lot of money. 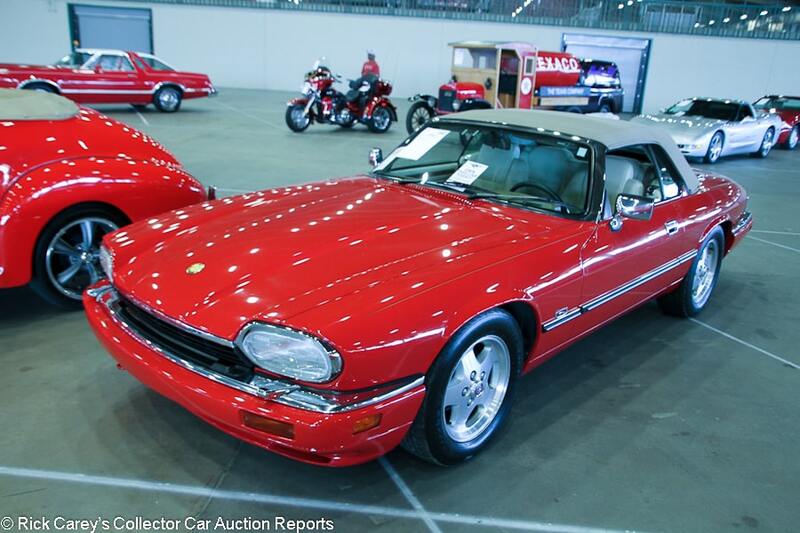 Lot # 192 1995 Jaguar XJ-S 2+2 Convertible; S/N SAJNX2746SC221188; Red/Cream leather; Tan cloth top; Visually maintained, largely original, 3 condition; Hammered Sold at $8,000 plus commission of 10.00%; Final Price $8,800. No Reserve. – Alloy wheels, six-cylinder engine, wood dash, cassette stereo, dash clock, power windows, air conditioning. – Repainted, and seemingly not blended very well because the back of the car is a darker shade than the front. It gets brighter the farther forward you go. Small dent in the left rear fender. Chips at the back of the driver’s door. Good, clean top. Driver’s seat shows a lot more wear and wrinkling than the 4,048 miles showing would suggest, although the mileage is not represented as actual. The rest of the interior is well kept other than the window switches on the console, the frame for which has broken and they are jiggling freely. Very clean engine bay. Tidy car underneath. No service records are represented. Not a great car but presentable and stylish, and while slower than the 12-cylinder cars, it’s way easier to keep running, plus you don’t buy one of these things for outright speed anyway. – While less expensive to keep running than a V-12, it won’t exactly be cheap, and this was not a bargain price. For now, though, it’s a decent amount of style for the money. 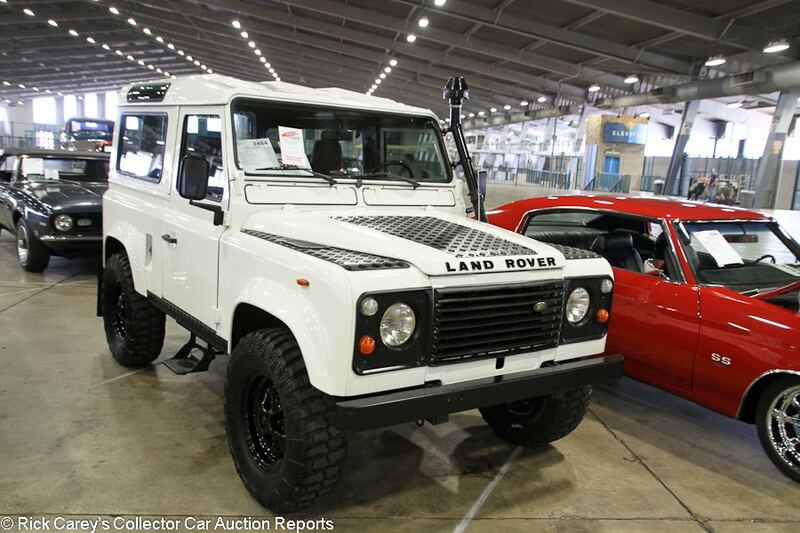 Lot # 2484 1987 Land Rover Defender 90 Hardtop 4×4; S/N SALLDVBB8AA298875; White/Brown cloth; Visually maintained, largely original, 2- condition; Hammered Sold at $41,000 plus commission of 10.00%; Final Price $45,100. With Reserve. – Snorkel intake, turbodiesel engine, tinted glass, aftermarket stereo. – Repainted with some orange peel near the windows. Represented with a new turbo and injector pump. Very tidy underneath. Surface rust poking through on the door hinges. Very good interior with newer carpets and upholstery. Aftermarket speaker in the back. A solid, attractive Defender. Not restored, but it has gotten significant attention. Likely an Italian market example given the metric instruments and stickers found in the door jamb. – Sold for $36,180 at Mecum Houston in April 2015, then $42,350 at Leake OKC last year. These results are both similar and similarly appropriate. The VIN also checks out as being old enough to be here in the U.S. legally, so nobody should have to worry about the Feds coming for it. 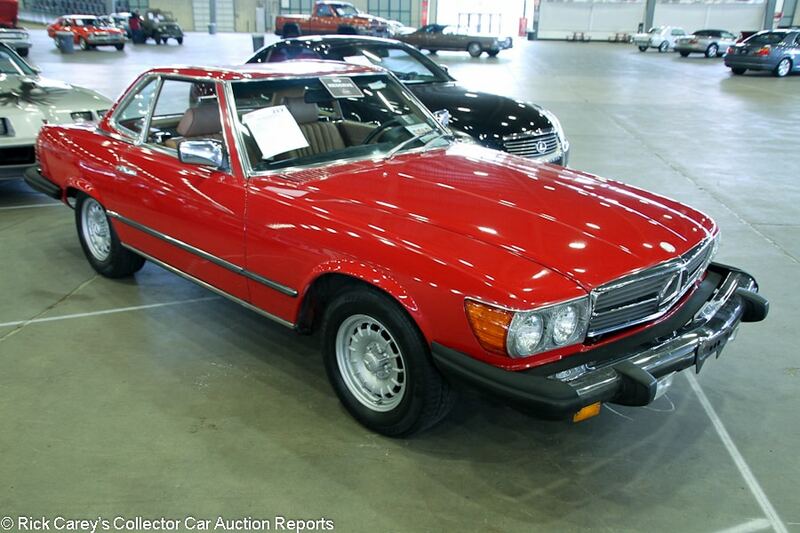 Lot # 217 1983 Mercedes-Benz 380SL Roadster; S/N WDBBA45A0DB025925; Red/Tan; Unrestored original, 3- condition; Hammered Sold at $5,800 plus commission of 10.00%; Final Price $6,380. No Reserve. – Both tops, Becker Grand Prix radio. – A few small tears in the driver’s seat and the upholstery is pretty dried out and tired. Otherwise, the interior is mostly very well kept considering the 124,679 miles. Paint and chrome are very dull and tired with numerous chips, scratches and touch ups. The rear window is delaminating at the bottom. Tidy, recently cleaned engine bay with recent-looking hoses and wires. Very much a used car with a ton of miles, and the 380 is the least desirable of the series. Even so, this is still a serviceable example. – Reported sold for $3,500 at Mecum Indy this year, and for $3,500 a year ago. Rough paint and a lack of history don’t really inspire bidder confidence, plus there may be some other undisclosed issues with this car, which would explain the three below-market results in quick succession. 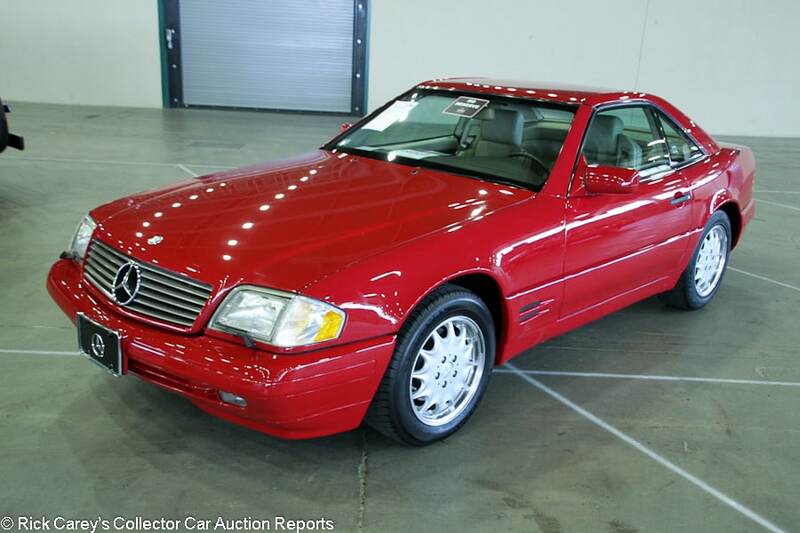 Lot # 154 1997 Mercedes-Benz SL500 Roadster; S/N WDBFA67F6VF147981; Red/Beige leather; Unrestored original, 2- condition; Hammered Sold at $6,500 plus commission of 10.00%; Final Price $7,150. No Reserve. – Uniroyal tires, tinted glass, power everything. – Headlight lenses are yellowing. Small chips on the nose, hood and A-pillars but mostly very good original paint. Very lightly worn interior. Showing 95,461 miles but not represented with any service history, which is not a good combination. – These R129-series SLs offer a fast, smooth, stylish and comfortable two-seater for an affordable price, at least until it comes time for a service. That this one has lots of miles and yet no documentation leads one to expect that the seller is expecting to pass off the expensive shop bills the next owner. At least the buyer here detected the omission and bought at a low price, but not as little as the buyer at Leake’s Dallas auction last November did, just $4,400. 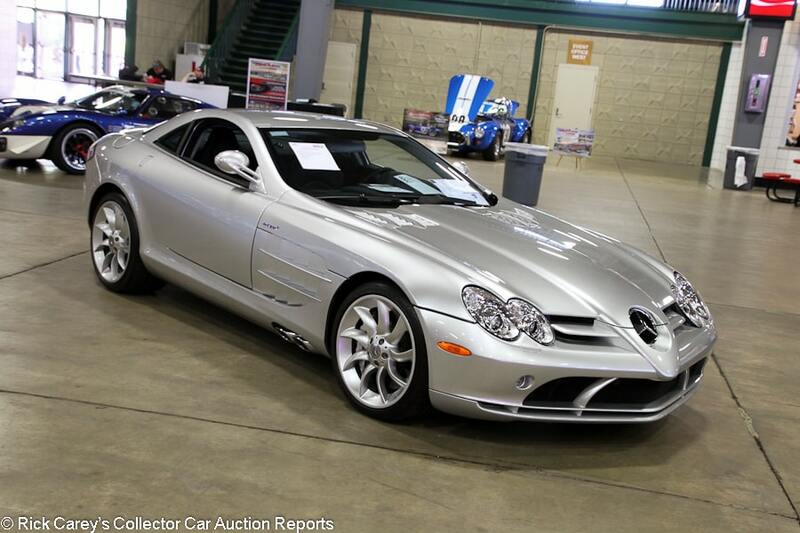 Lot # 902 2006 Mercedes-Benz SLR McLaren Coupe; S/N WDDAJ76F56M000945; Silver/Black leather; Unrestored original, 2 condition; Hammered Sold at $227,500 plus commission of 10.00%; Final Price $250,250. With Reserve. – Bose stereo, power windows, power seats, climate control, carbon fiber seats, books and keys. – Clear bra on the hood, nose and side mirrors. Showing 10,180 claimed original miles and looks like a new car. – These were nearly half-million dollar cars when they were new, but appreciation for them is lagging behind that of their other limited production high-performance peers. A fair number have sold at auction over the past couple of years and they rarely break 300 grand, so the reported high bid here was accepted although perhaps with regret. 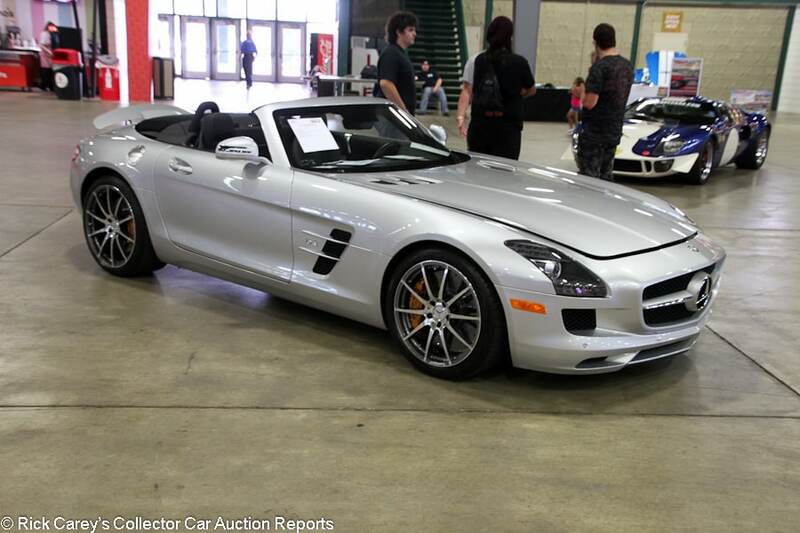 Lot # 903 2012 Mercedes-Benz SLS AMG Convertible; S/N WDDRK7HACA008275; Silver/Black leather; Unrestored original, 2 condition; Not sold at Hammer bid of $135,000. With Reserve. – Carbon ceramic brakes, carbon fiber trim, orange calipers, climate control, power top. – Showing 2,855 claimed original miles and looks every bit like a brand new car. – While it doesn’t have the gullwing doors comparable SLS coupe, the roadster version is similarly stylish. It cost around $200,000 when new, which was about 10 grand more than the coupe. At barely five years old, this is essentially still just a used exotic. Dealers are currently asking the same kind of money as the reported high bid here, so this car should have gone to a new home. 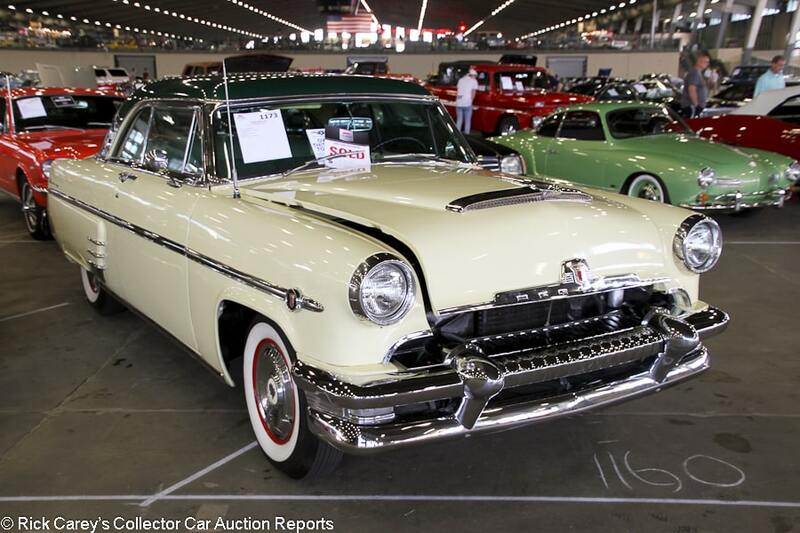 Lot # 1173 1954 Mercury Monterey 2-Dr. Hardtop; S/N 54WA60889M; Light Yellow, Green roof/Green, Yellow vinyl; Older restoration, 3+ condition; Hammered Sold at $18,500 plus commission of 10.00%; Final Price $20,350. With Reserve. – 256/161hp, automatic, wheel covers, whitewalls, fender skirts, aftermarket air conditioning, Edelbrock carb, dual mirrors, later cassette radio, dash clock. – Older mostly restored engine bay. Paint run on the right side of the hood. The rest of the paint is older but rather good. Dull older chrome. Lightly scratched and dinged up window frames. Good, lightly worn restored interior. Restored at one point, and enjoyed since. – The first year for the overhead valve Mercury engine, rather sedately tuned even with the standard 4-barrel carburetor. This is far from the best one out there, but is more than good enough to be driven with some pride and is a sound value at this price. 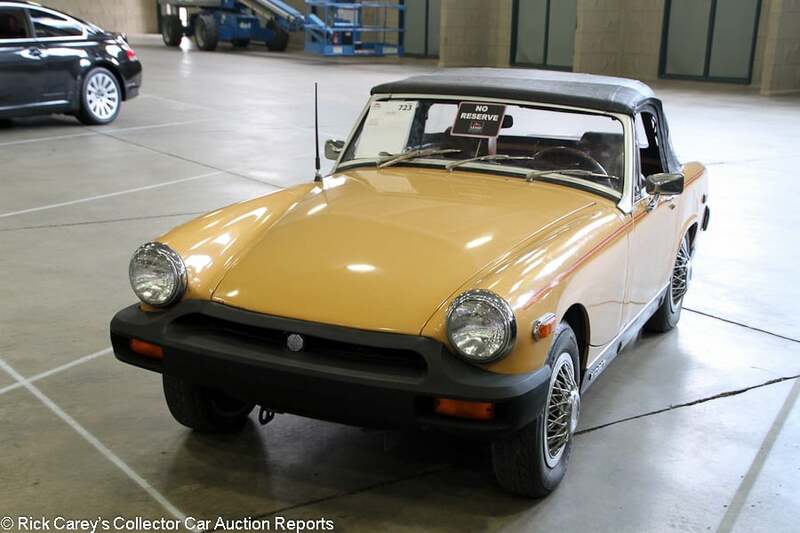 Lot # 723 1976 MG Midget 1500 Roadster; S/N GAN6UG181133G; Yellow, Orange/Gray vinyl; Black vinyl top; Unrestored original, 4+ condition; Hammered Sold at $3,250 plus commission of 10.00%; Final Price $3,575. No Reserve. – Wire wheel covers, luggage rack, dual mirrors, missing radio. – Bad original paint with chips and scratches all over, plus some discoloration on the hood and around the filler cap. The luggage rack is scratched up. Oxidized chassis and it looks rough under there, but there’s no major rot. Under the wheel covers, the wheels are losing paint and are dirty. Good original top. Pitting on the steering wheel. Flat bottom on the driver’s seat, but the upholstery is good. Radio is missing. Discoloration on the door panels. Lots of these later rubber bumper Midgets have faced years of neglect thanks to not being worth enough to fix up properly. This is a perfect example of that. – Offered here in 2014 with a reported high bid of $5,500. If the present consignor also presented it then this reasonable price will cause no small amount of regret. Don’t be surprised to see it become an historic racing car, or parted out. 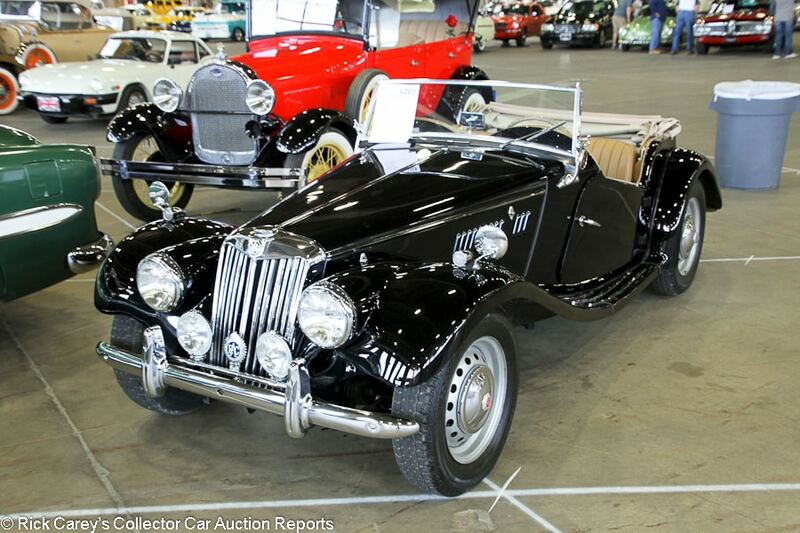 Lot # 1203 1954 MG TF Roadster; S/N HDA362255; Black/Tan leather; Beige cloth top; Enthusiast restoration, 2- condition; Hammered Sold at $19,750 plus commission of 10.00%; Final Price $21,725. With Reserve. – Hub caps, dual wing mirrors, Lucas driving lights, badge bar, rear-mounted spare, banjo steering wheel. – One owner until 2005. Originally sold in Belgium with metric instruments. Very good newer seats and carpets. Slightly dull original gauges. Lightly worn older top with some paint rubbing off the top frame. Small chip in the middle of the hood but otherwise very good older paint. Tidy and restored underneath. Dripping oil, but that’s to be expected. A basic but competent restoration resulting in an attractive car, made slightly more interesting by the euro instruments. – This car sold for $23,100 at Barrett-Jackson Scottsdale this year. Even that result was a serious bargain for a solid restored TF, making this even lower result even better. 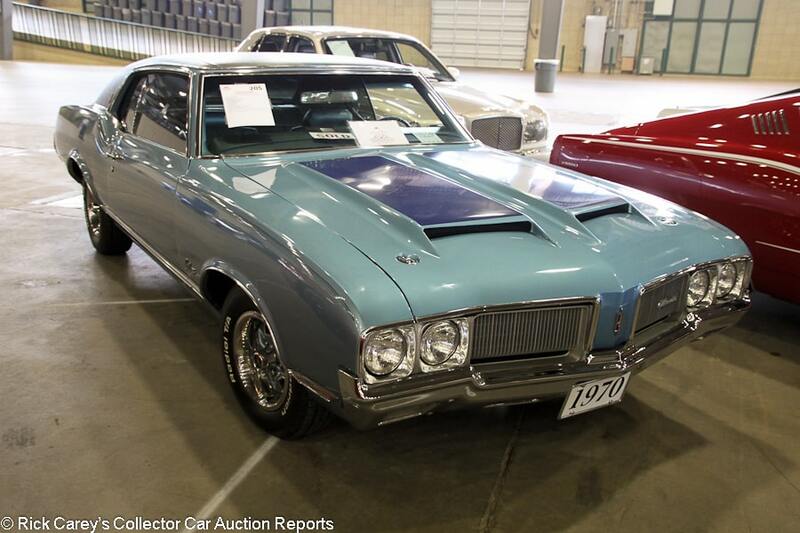 Lot # 205 1970 Oldsmobile Cutlass Supreme 2-Dr. Hardtop; S/N 342570M372494; Light Blue, Dark Blue stripes and vinyl roof/Dark Blue vinyl; Older restoration, 2- condition; Hammered Sold at $16,250 plus commission of 10.00%; Final Price $17,875. With Reserve. – 350/250hp, automatic, Radial T/A tires, tinted glass, power steering, power brakes, air conditioning, modern stereo, bench seat, column shift, dash clock. – Roof vinyl is a bit splotchy and discolored. Very good paint and chrome other than some fisheyes on the trunk. Very good interior. Clean and restored underneath. An unremarkable car equipment-wise, but in fine restored condition for the most part. – This handsome, well-equipped hardtop in very good condition for under $20 Large is a sound acquisition with some style and enough performance to keep up with traffic. While it won’t do much at the stoplight GP, it won’t require new rear tires every season, either. 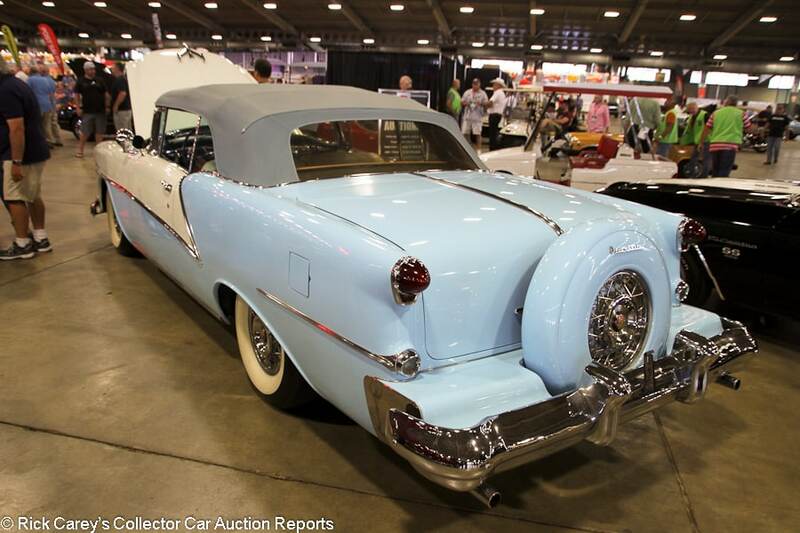 Lot # 737 1954 Oldsmobile Ninety-Eight Starfire Convertible; S/N 549M37737; White, Light Blue/White, Blue vinyl; Light Blue vinyl top; Visually maintained, largely original, 3+ condition; Hammered Sold at $43,000 plus commission of 10.00%; Final Price $47,300. No Reserve. – 324/185hp, automatic, wire wheel covers, wide whitewalls, spotlight, Continental kit, Super De Luxe radio, power steering, power brakes, power windows, power top, power seat, Autronic Eye. – From the HG Ground collection. Heat rash on the exhaust. The engine looks like it was repainted at some point. Big scuff on the left front fender, but otherwise very good older paint. The doors stick out very slightly at the bottom. Small scratches and light discoloration in the top, the rear window of which is scratched and cloudy. Scratches and scuffs on the rear bumper. Lightly worn, lightly discolored seats and door panels. Never fully restored, but not totally original, either. It’s gotten attention when needed to keep it presentable. – Sold by Mecum at Dallas in September 2012 for $62,540, the result today is a big come-down from that, but no less than the car’s erratic old cosmetic restoration deserved. 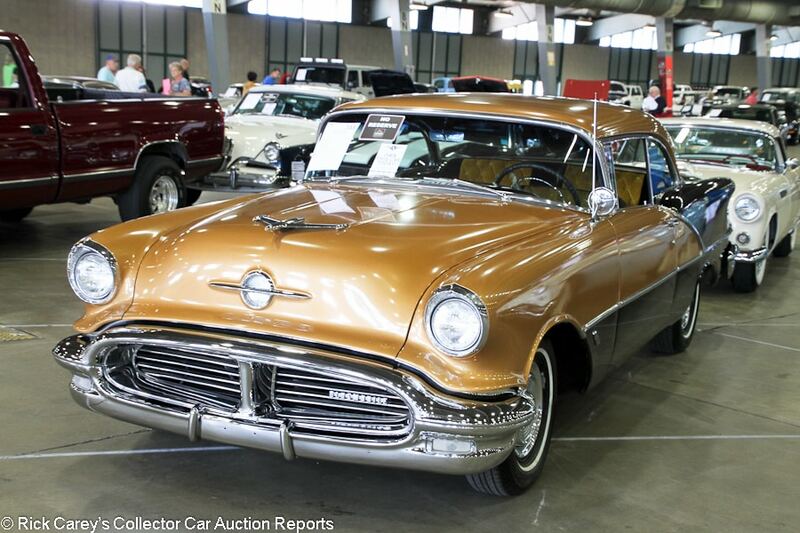 Lot # 733 1956 Oldsmobile Super 88 2-Dr. Hardtop Holiday; S/N 567K1607; Gold, Black/Black, Gold cloth; Enthusiast restoration, 3 condition; Hammered Sold at $9,000 plus commission of 10.00%; Final Price $9,900. No Reserve. – 324/240hp, automatic, wheel covers, Hankook narrow whitewalls, power steering, power brakes, pushbutton radio, aftermarket under dash gauges. – From the HG Ground collection. Big chip in the nose and some large blisters in the paint right below it. Big pieces of paint flaking off the right front fender. Several scratches on the right side of the body. The diamond tufted seats and door panels are a custom touch, but the rest of the interior is unrestored and in good shape. The chassis was undercoated at some point. A car to restore or enjoy while addressing its needs. – The moderate price of this Olds commends itself to someone looking for a realistically priced project or as an entry into car collecting with a basically sound car amenable to inexpensive attention to keep it going and make it modestly better. 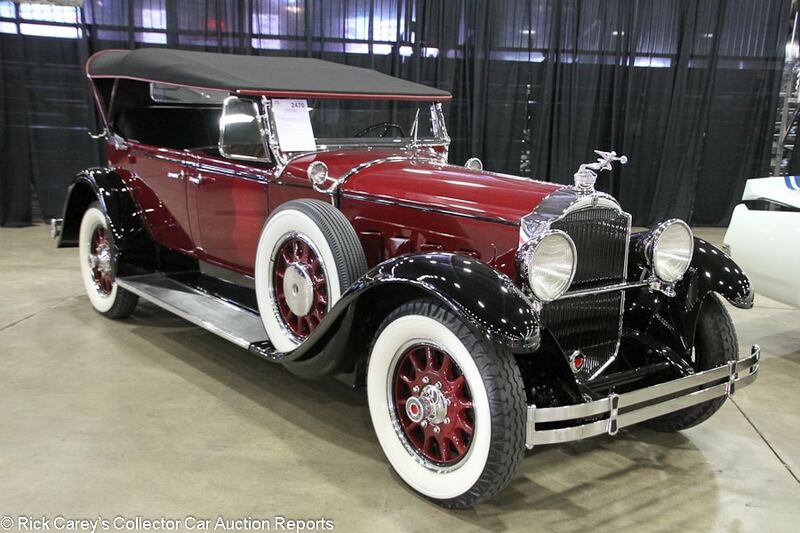 Lot # 2470 1929 Packard 640 Custom Eight Touring Phaeton; S/N 174637; Burgundy, Black/Black leather piped in Red; Black cloth top; Recent restoration, 2- condition; Hammered Sold at $63,500 plus commission of 10.00%; Final Price $69,850. With Reserve. – Artillery wheels, Firestone whitewalls, dual sidemount spares, Goddess of Speed radiator mascot, wind wings, rear suicide doors, luggage rack, Jaeger dash clock. – The restoration on this car was finished this year, but that’s not when all the work was done. There are a few chips in the painted grille. The spare tires are older and a bit discolored. The paint is good and recent but not show quality. Excellent interior. Excellent top. Very tidy underneath. A very attractive car, but far from ready for Pebble Beach. – A thoroughly elegant, high quality, CCCA Full Classic ™ open car with generous equipment, but curiously spotty in its presentation, like it was restored, then driven, then freshened, rather than being the claimed “Fresh restoration completed [in] 2017.” In any event it sold for a price that is nothing if not reasonable, according its new owner access to CCCA and other events with a quality, open bodied, classic Packard. 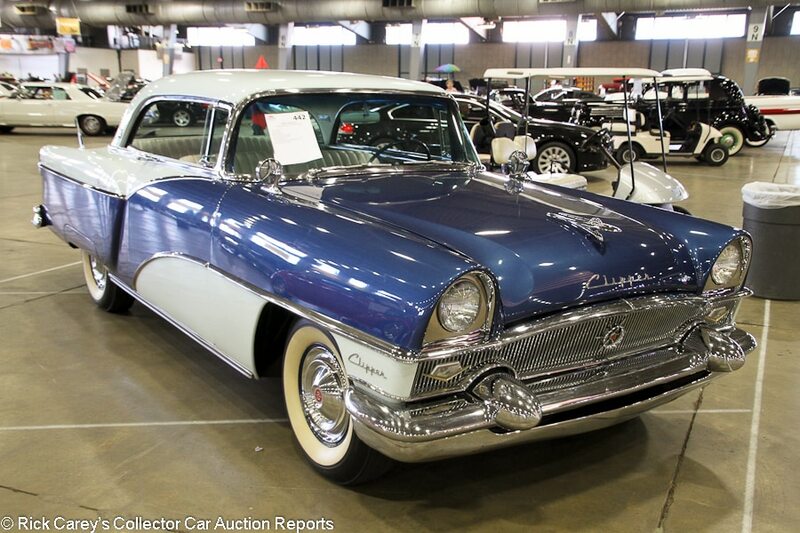 Lot # 442 1955 Packard Clipper Super Panama 2-Dr. Hardtop; S/N 55472509; Blue, White/White vinyl with Dark Blue cloth inserts; Older restoration, 2- condition; Hammered Sold at $15,500 plus commission of 10.00%; Final Price $17,050. With Reserve. – 320/225hp, 3-speed, wheel covers, whitewalls, fender skirts, dual mirrors, dual antenna, hood ornament, dash clock, pushbutton radio. – Dull chrome and brightwork. Discolored whitewalls. Very good older paint. Very good restored interior. Lightly worn restored underneath. A straightforward lightly used older restoration. – The car card says Packard built 7,016 Super Panama 2-door hardtops in 1955, a suggestion of rarity backed up by how infrequently they appear at auction where Caribbean convertibles are commonplace by comparison. The result here is reasonable for this model, but inherently a good value at much less than a comparably presented Chevrolet Bel Air hardtop. 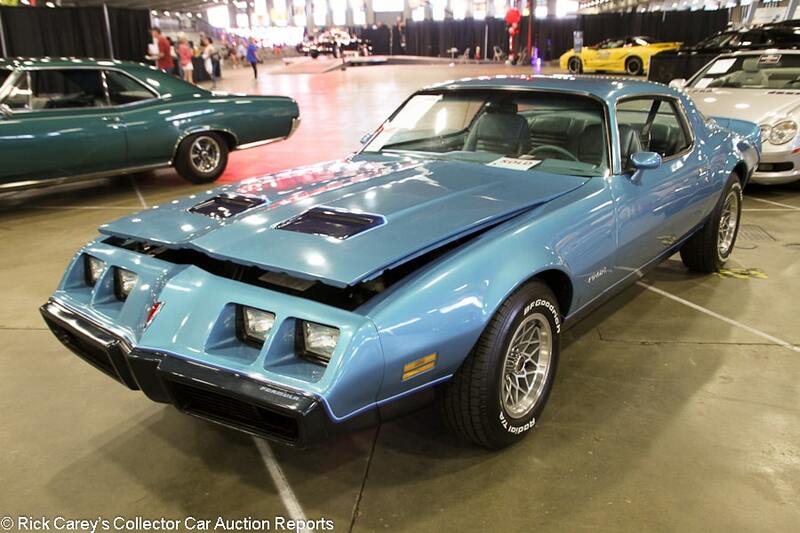 Lot # 2409 1979 Pontiac Firebird Formula Coupe; S/N 2U87K9L148125; Bright Blue, Dark Blue/Light Blue vinyl; Unrestored original, 2- condition; Hammered Sold at $16,000 plus commission of 10.00%; Final Price $17,600. With Reserve. – 403/175hp, automatic, snowflake wheels, new Radial T/A tires, power steering, power brakes, air conditioning, power windows, pushbutton radio. – The original paint is a bit dull and there is some crazing on the front bumper, but it’s blemish-free and very good for almost 40 years old. The tires are new. The interior is very lightly worn and the seat belts are a bit frayed, but again it’s very good for all original. Very tidy engine bay and underbody. Represented as a restored car, but the major work was limited to what’s under the skin. 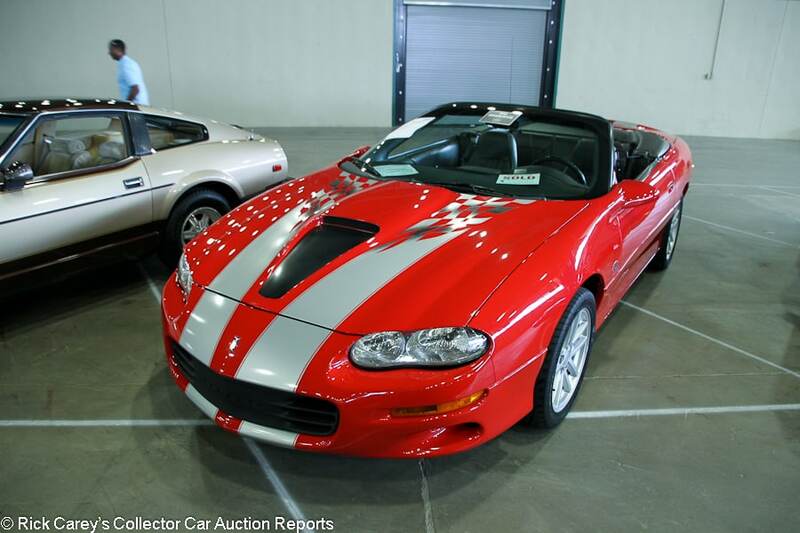 – Not a Trans Am, but pretty close and a good value at this price for its equipment, condition and originality. 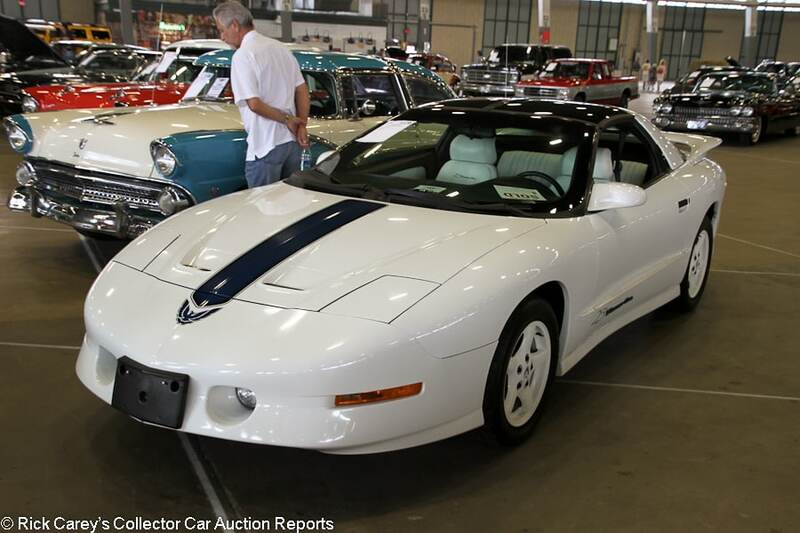 Lot # 1178 1994 Pontiac Firebird Trans Am 25th Anniversary Coupe; S/N 2G2FV22P8R2245761; White, Blue/White leather; Visually maintained, largely original, 2- condition; Hammered Sold at $10,200 plus commission of 10.00%; Final Price $11,220. With Reserve. – 350/275hp, automatic, T-Tops, CD stereo. – Small scratch on the nose. Lightly swirled but sound paint. Touch up on the right front fender. Very lightly worn interior with no discoloration on the white seats. Showing 35,612 miles, but clearly treated very well from new. – 2,000 25th Anniversary Trans Ams were built and it was just a cosmetic package, but they are still worth considerably more than a standard LT1-powered TA from the same year. This one sold at Leake Tulsa in 2015 for $13,200, and while prices for these cars have crept upward since then, this example didn’t enjoy those gains. In Tulsa, it went for barely more than what a standard car would bring, which means the buyer got a fine bargain. 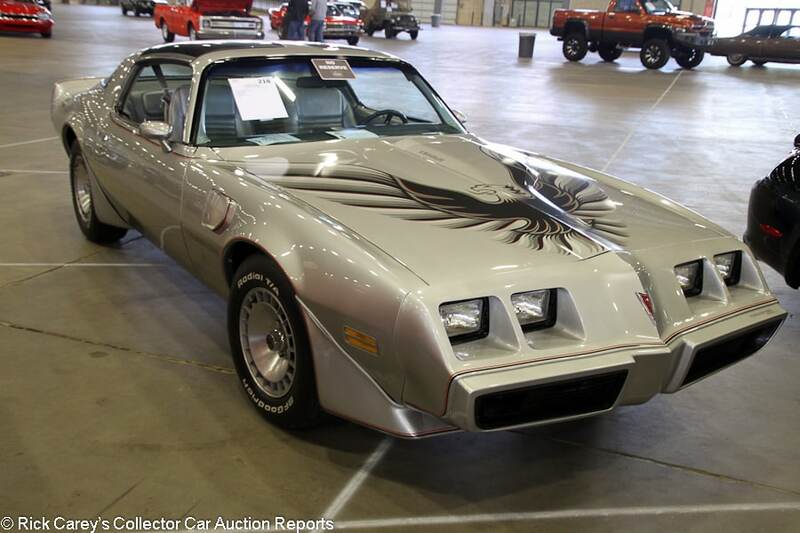 Lot # 218 1981 Pontiac Firebird Trans Am Turbo Coupe; S/N 1G2AW87T1BL123975; Silver, Black graphics/Silver; Visually maintained, largely original, 3+ condition; Hammered Sold at $12,600 plus commission of 10.00%; Final Price $13,860. No Reserve. – 301/200hp turbo engine, automatic, glass T-tops, Radial T/A tires, power windows, air conditioning. – Worn steering wheel and lightly worn switchgear. A small spot of discoloration on the passenger’s seat but otherwise great original interior. The screaming chicken decal was not applied all that carefully and there are some air bubbles in it. The wheels could stand a cleaning. Very good repaint. Well maintained but unrestored underneath. A well maintained car with a single repaint and showing 77,802 miles. – The Trans Am Turbo was only around for the 1980 and 1981 model years before the introduction of the third generation Firebird. They were quicker than the standard naturally aspirated 301-powered TA of the same year, but still slower than the old 400-powered car. The Turbos are also relatively rare but not rare enough to be particularly collectible. This Turbo TA sold for $14,300 at Mecum Indy three weeks ago and was a decent value at this price. Lot # 2415 1966 Pontiac GTO 2-Dr. Hardtop; S/N 242176K119823; Marina Turquoise/Light Blue vinyl; Enthusiast restoration, 3+ condition; Hammered Sold at $39,500 plus commission of 10.00%; Final Price $43,450. With Reserve. – 389/360hp, Tri-Power, 4-speed, PMD wheels, red line tires, Tri-Power, Hurst shifter, console, bucket seats, factory radio, Safe-T-Track, PHS documents. – Very good chrome. Shiny paint, but there is orange peel on the A-pillars. Very good interior. Driver’s seat is a bit flat. Clean and tidy underneath. Tri-Power is added. Fully restored in attractive colors with desirable equipment and enjoyed only lightly, but not done to exacting standards. – Hammered not sold at Mecum Indy two years ago at a $45,000 high bid, which was a fair offer then and would be now for a car in this condition with desirable if added equipment. This result is slightly more favorable to the buyer, but not extraordinary. 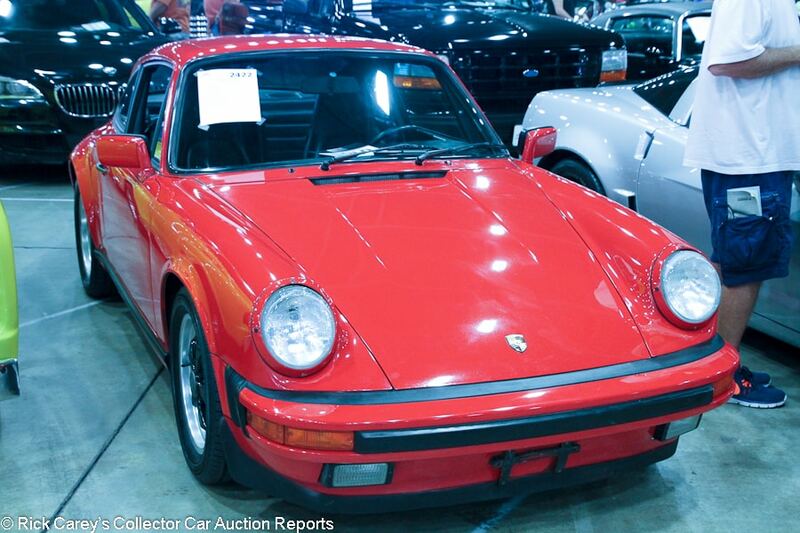 Lot # 2422 1987 Porsche 911 Carrera Coupe; S/N WP0AB0913HS121700; Guards Red/Black leather; Visually maintained, largely original, 3 condition; Hammered Sold at $39,500 plus commission of 10.00%; Final Price $43,450. With Reserve. – Black painted Fuchs wheels, Yokohama tires, sunroof, Blaupunkt cassette stereo, power windows, air conditioning, tool roll, owner’s manual. – Stored for 17 years in Texas until last year. Recent work included spark plugs and wires, fuel pump, brakes and fuel system. Big touch up on the hood. Big scratch on the right headlight bezel. The finish of the original paint is a little dull but OK. Very good, very lightly worn interior. There are some scratches on the rear window. Frankly not a great car by Porsche standards, and should be better even with the 63,678 miles on the odometer. It may have been in storage for years, but it was used plenty before it was put up. This isn’t a time-warp example. 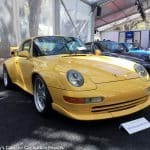 – Despite it being mostly a muscle car and pickup crowd in Tulsa, this brought a strong price for a Carrera in this condition and the seller should be perfectly satisfied. 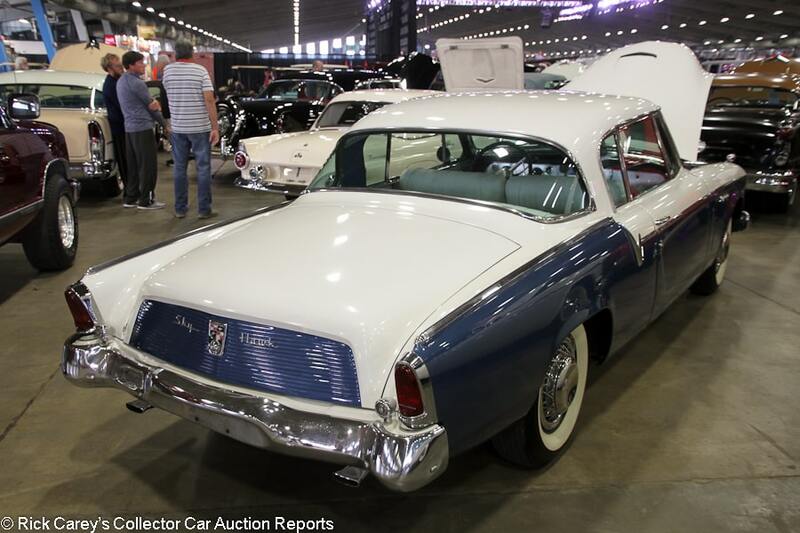 Lot # 734 1956 Studebaker President Sky Hawk Hardtop Coupe; S/N 7811391; Dark Blue, White/White vinyl with Blue cloth inserts; Enthusiast restoration, 3+ condition; Hammered Sold at $16,500 plus commission of 10.00%; Final Price $18,150. No Reserve. – 289/210hp, 3-speed, wire wheel covers, whitewalls, bench seat, column shift. – From the HG Ground collection. Rebuilt engine and transmission. Rebuilt clutch, brakes, radiator and heater. Painted 16 years ago. Clean, lightly run engine bay. Sound older paint with some chips behind the doors and above the rear bumper. Dull original chrome. Lightly pitted brightwork. Good redone seats. Cracking steering wheel cap and severe cracking in the painted rim. Lightly discolored headliner. Never fully restored, but given enough attention to keep it attractive and sound mechanically. – The Sky Hawk was a 1956-only submodel in the President series. It had less chrome than the Golden Hawk and didn’t have the tall tail fins. It also had a smaller engine. This one sold for $28,050 at Mecum Dallas last year. This result was a relative bargain, and a price somewhere in the middle of these two transactions would have been fully realistic. 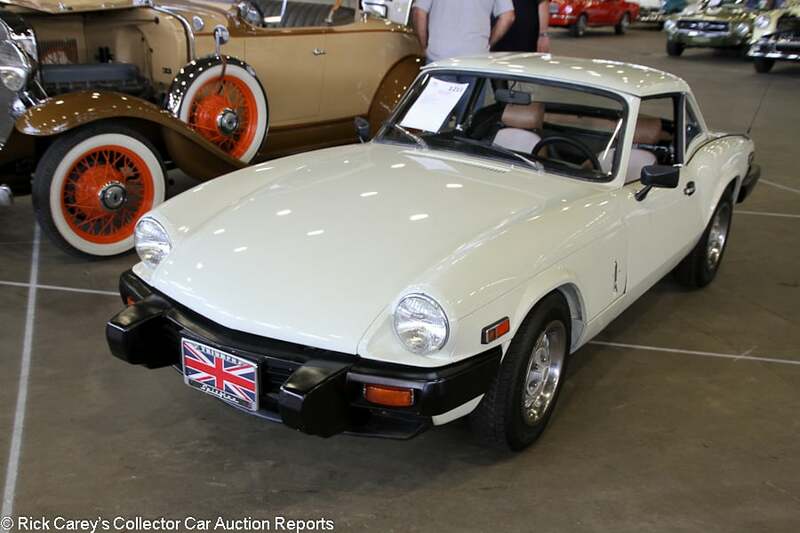 Lot # 1211 1980 Triumph Spitfire Convertible; S/N TFVDW6AT005643; Beige, Beige hardtop/Brown vinyl with houndstooth cloth inserts; Beige vinyl top; Older restoration, 2- condition; Hammered Sold at $7,000 plus commission of 10.00%; Final Price $7,700. With Reserve. – Hardtop, store brand tires, overdrive, JVC CD stereo. – Three big scratches on the nose. A few cracks in the left front bumperette. Some paint cracking in the drip rails and at the top of the windshield frame. Wavy rear bumper. Finish on the older paint, though, is shiny and pretty high quality. Very good, mostly restored interior. Very tidy and restored underneath. Far from perfection, but still a lot closer to it than the vast majority of ’80 Spitfires on the road. – A final-year Spitfire in such great shape with a factory hardtop can realistically expect to crack five figures, so this was quite a bargain. 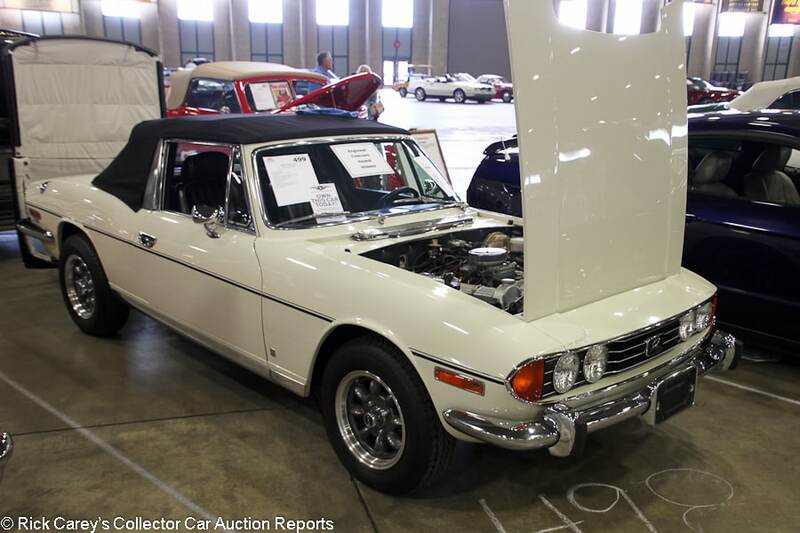 Lot # 499 1973 Triumph Stag Convertible; S/N LE23713U0; White, Black hardtop/Black; Black cloth top; Older restoration, 2 condition; Hammered Sold at $18,000 plus commission of 10.00%; Final Price $19,800. With Reserve. – 3-liter, 145hp V8, 4-speed, Minilite-style wheels, hardtop, Holley carb, air conditioning, power steering, power brakes, walnut dash, Sony CD stereo, power windows. – Mostly very clean engine bay. Light scuff on the hardtop. Very good paint, chrome and interior. A quite well done Stag with nothing to pick on, which is something you rarely hear when it comes to these often flawed and compromised cars. Cosmetically restored in 2006, then mechanically restored in 2014 and recently a regional concours winner. 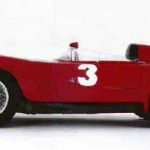 – The Stag featured what is essentially two Triumph fours on a common crank to form a V-8. The engine was problematic, and quickly earned a poor reputation. It’s also more of a cruiser than a sports car, so it didn’t appeal to Triumph’s traditional buyers. They’ve never been particularly valuable, and not all that many have survived, let alone received a quality restoration like this one has. It would be hard to find a better one than this, and while the result here is top dollar, it was deserved. 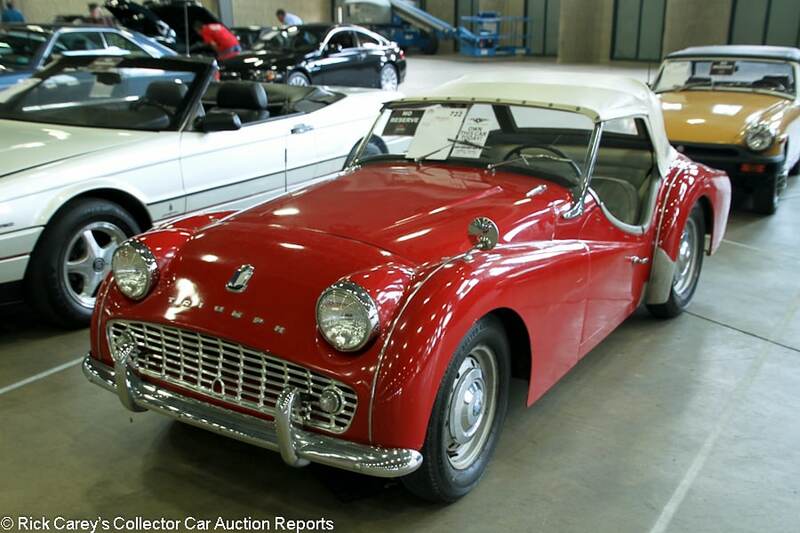 Lot # 722 1959 Triumph TR3A Roadster; S/N TS47011L; Red/Gray vinyl; White vinyl top; Visually maintained, largely original, 4 condition; Hammered Sold at $5,900 plus commission of 10.00%; Final Price $6,490. No Reserve. – Wheel covers, store brand radial tires, single wing mirror, banjo steering wheel. – Bad older respray. There are chips and scratches all over, but there are also lots of deep scratches down to bare metal on the right front. Surface rust is showing on the wheels. The right rear bumperette is missing. The top is scratched up. Lightly worn seats. Discoloration on the dash. Rot in the right rear wheel well. Lots of oxidation underneath. Basically a running project car. It’s too rough for its flaws to be charming. – This result isn’t a leap of faith in the new owner’s ability to complete a budget restoration but rather a realistic price to pay for a project car. 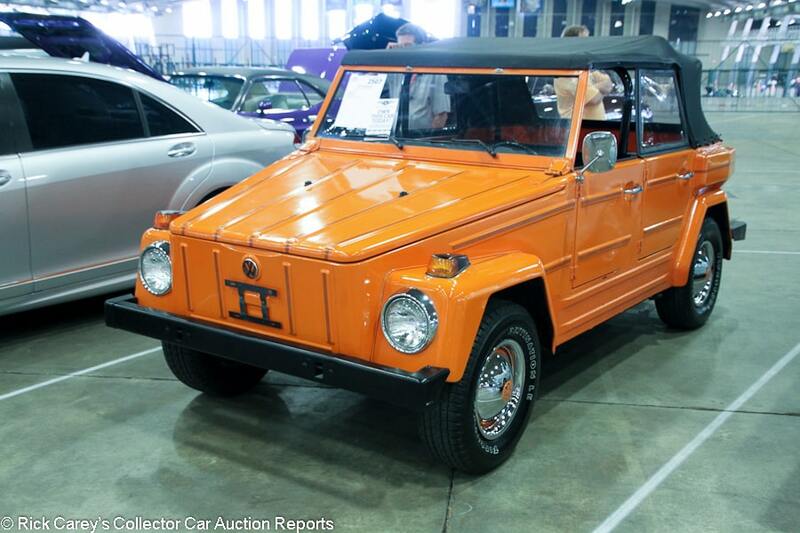 Lot # 2507 1974 Volkswagen 181 Thing Convertible; S/N 1842625198; Orange/Black vinyl; Black vinyl top; Visually maintained, largely original, 3 condition; Hammered Sold at $11,500 plus commission of 10.00%; Final Price $12,650. With Reserve. – Hub caps and trim rings, light truck radial tires. – Very dull old repaint that was never high quality to begin with. There are lots of chips, scratches, touch up and small dents in the body. Decent replacement top. Newer upholstery but otherwise original interior. The frame was undercoated at some point. A budget Thing in an appropriately loud color. Not a good example at all, but it’s in decent enough condition and it’s not rusty. – Sold at Branson Fall in 2009 for $11,880, at Leake Tulsa in 2015 for $14,575, and at Leake OKC back in February for $10,010. For a barely presentable driver quality Thing, the two most recent results are roughly appropriate, while the 2015 result was a bit over the top. With some serious attention to the body, though, it could bring that much money again, but for now this is what it’s worth.